When I was placed on vigil to join the Order of the Laurel, I thought carefully about who I would ask to make this important scroll. I am fortunate to know many, many talented and well-recognized scribes. After some deliberation, I decided to start off as I intend to go on in my career as a Laurel, during which time I hope to continue to foster the arts and sciences, and I picked two up-and-coming scribes who show great promise: Lady Godaeth and Lady Aeffe. Not sure who they are? I hope by the end of this article, you have some inkling of the wonderful attributes and talents I see in them. What was the inspiration for this scroll? Lady Godaeth explains that they “always try to select an exemplar specific to the period, culture, etc. of the persona of the person receiving the award. 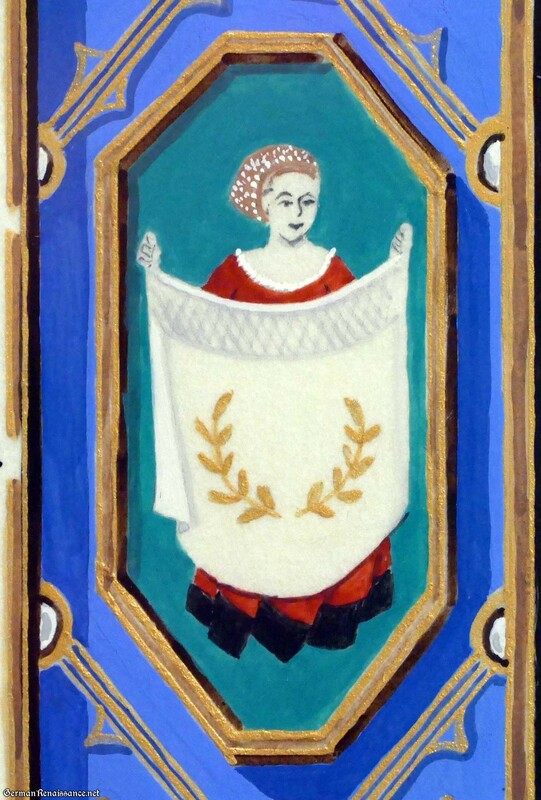 In the case of Meisterinne Genoveva, we settled on a Flemish manuscript in the Getty Museum by an Unknown artist, ca. 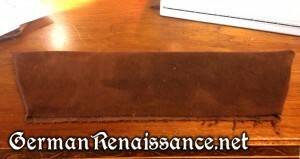 1525-1530.” The page dimensions of the extant scroll are 6 ⅝ x 4 ½, which is about the size of a page from a trade paperback. 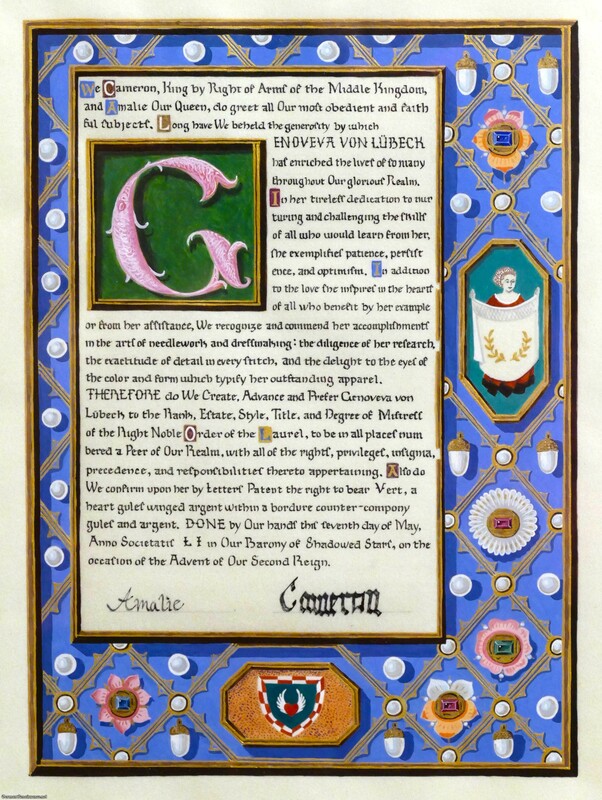 The extant scroll was made with tempera colors, gold paint, and gold leaf on parchment. Lady Aeffe illuminated the scroll, and you’ll note the striking similarity to the extant scroll with notable and personal differences. 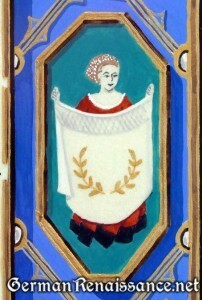 Aeffe explained that the “original image of Veronica holding up her veil with its miraculous image of Christ’s face was changed to a miniature of you [Genoveva], in your distinctive dress, holding up a pleated piece of fabric with a Laurel wreath in lieu of Christ’s face.” That was a stroke of brilliance, for pleatwork is my passion. 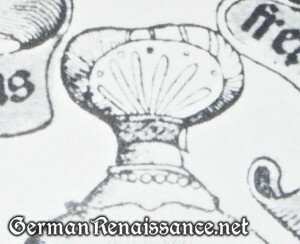 I’ve included a closeup of that part of the scroll so you can admire the artistry. You’ll also note my arms appear at the bottom in place of the Lamb of God. The plethora of pearls and gems are particularly appropriate to my persona. And, though it wasn’t planned, the acorn is a symbol of my Laurel’s (Mistress Crespine’s) sisterly household. The acorn is also the very first award token I ever received in the Barony of Cynnabar. I am overjoyed to be the recipient of this priceless piece of art. Thank you, Godaeth and Aeffe, for rising to my challenge and making my world look and sound more beautiful than it already is. I look forward to all of your future endeavors! 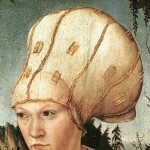 A forehead cloth. This is likely a wide band of silk that wraps around your head. 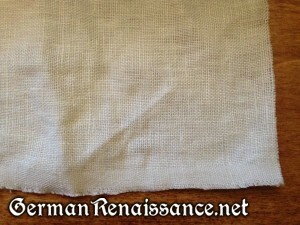 (Optional) A very fine, sheer linen undercap (D-shape, somewhat similar to the folk Dutch caps of today — the side of it may peek out from under the stickelchenand even fold up at the sides like wings). 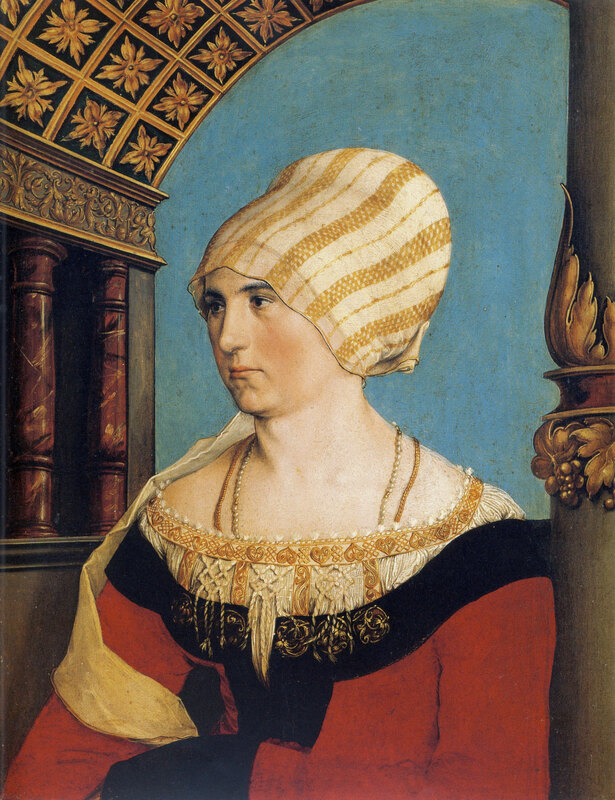 Note: In some portraits, the linen undercap is replaced by braids, peeking out over the forehead cloth and under the stickelchen (you can see this in the portrait of the small girl below). The stickelchen itself, likely made of silk. 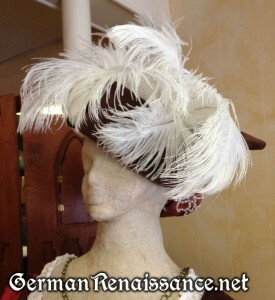 The stickelchen is decorated with pearls, jewels, and even spangles, either all over or on the band/brim only. 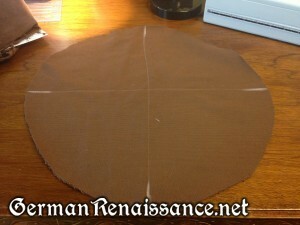 To get the stiff shape of this cap, you’ll want to start with a base of buckram and put your silk over that. 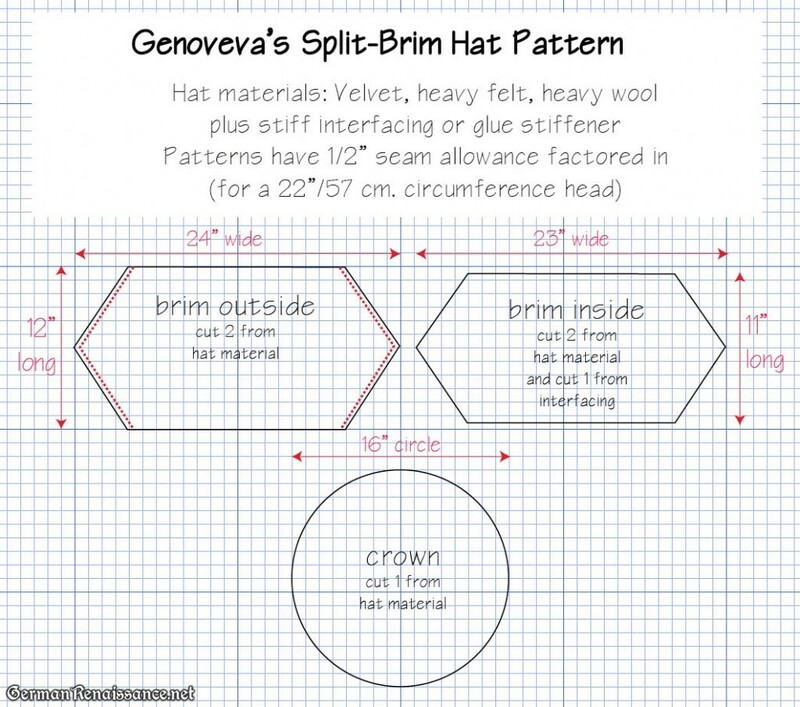 I have not yet made this cap, but here is the basic pattern I would begin with and then tweak from here. 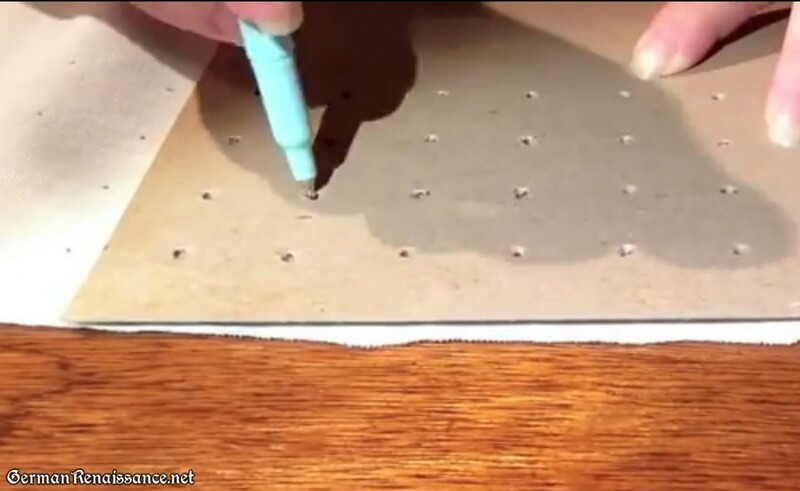 I would try making it from paper first until it has the right shape (that’s how I got this approximate pattern). 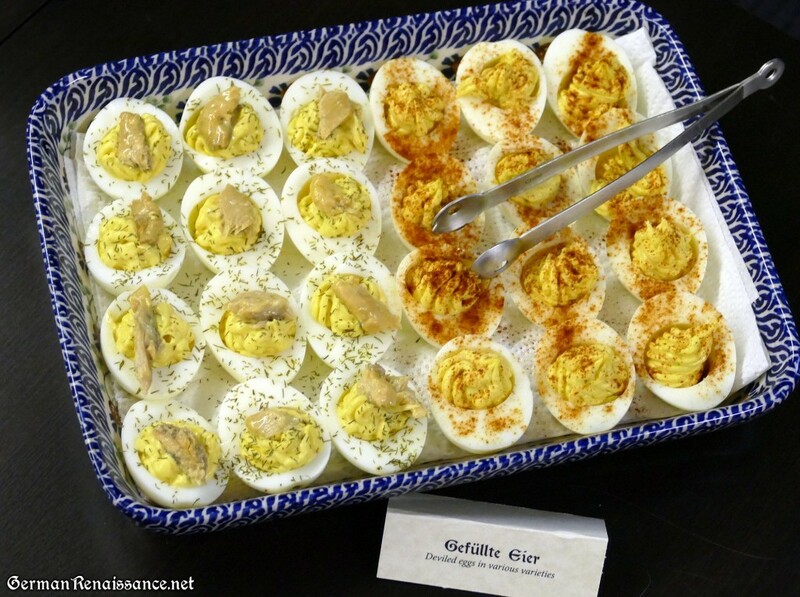 The menu was developed using some modern recipes and the chefs made efforts to create and present them in as period form as possible focusing on the flavor of the dishes. This is a semi-dried sausage traditionally made in Southern Germany. It has a history as soldier’s food because it keeps without refrigeration. Here’s a simple description of how Hannah told me she and Ilse made the cheese—for more information, see Hannah’s documentation at the Regional A&S competition (which will eventually appear on her upcoming blog). Pour a gallon of milk and a quart of heavy cream into a large, sterilized pot. 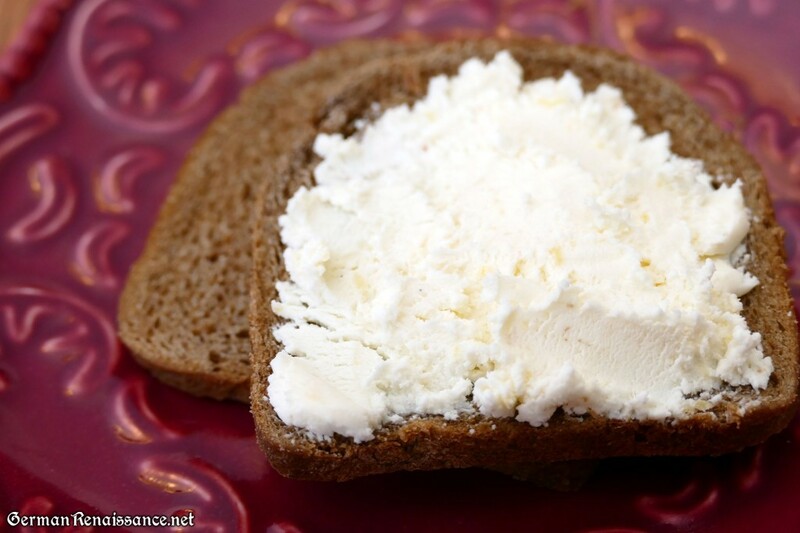 Heat the milk until a slight steam rises from the surface (180-195-degrees). Do not let it boil. 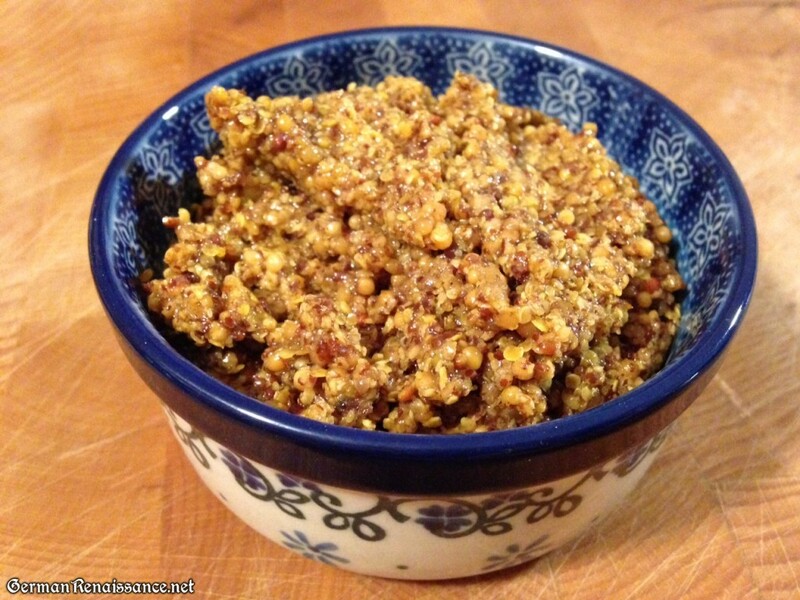 Once steaming, turn the heat to low and add in your curdling agent slowly while stirring. (Hannah used the juice of three lemons and three tablespoons of grated lemon peel as she prefers the flavor, but a half cup of vinegar would be more historically accurate). Once you see the milk proteins begin to curdle and clump together (become “whey”), strain the mixture in cheesecloth to separate the curds (clumps) from the whey (liquid). Pull up the cheesecloth by each corner and tie it into a small bag, then hang this bag over a container of some kind to catch the whey liquid. The less it drains, the moister it remains, so simply stop hanging when it gets to the consistency you prefer. Hannah prefers to let it drain two hours. 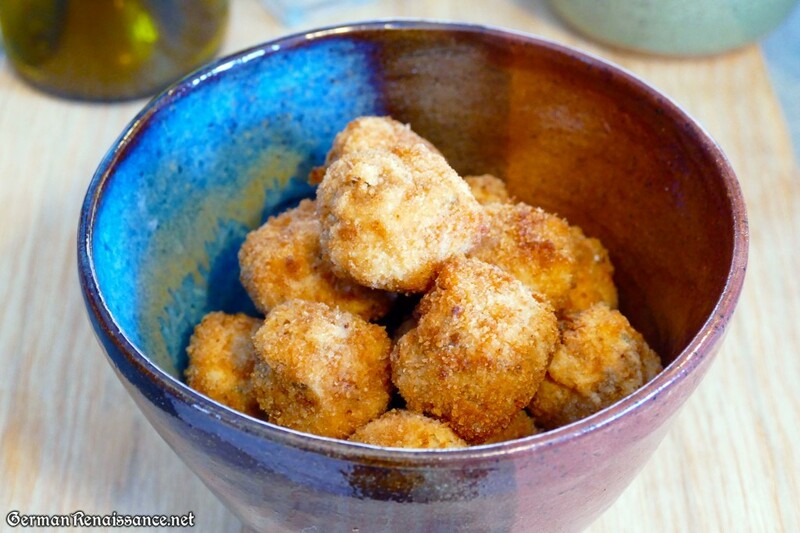 Scrape the curds inside the cheesecloth into a container you can seal and add a bit of salt. Enjoy by spreading the cheese however you like, or put it in a cool place overnight to let it mature a bit more. 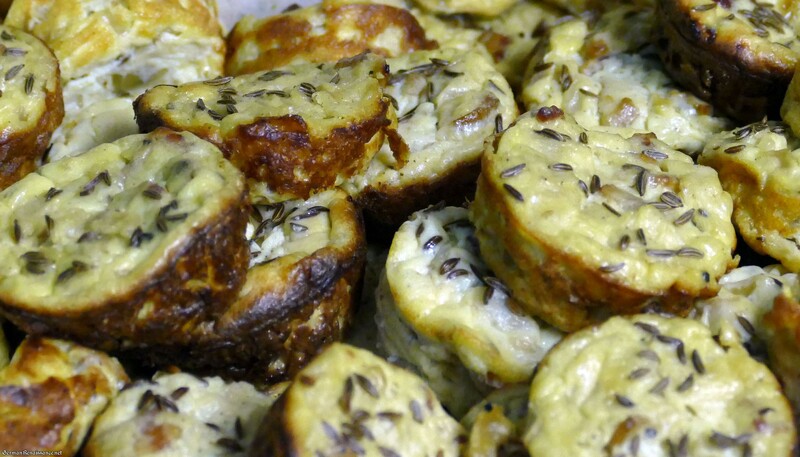 It’s good flavored with some herbs and garlic powder if you get tired of it plain. 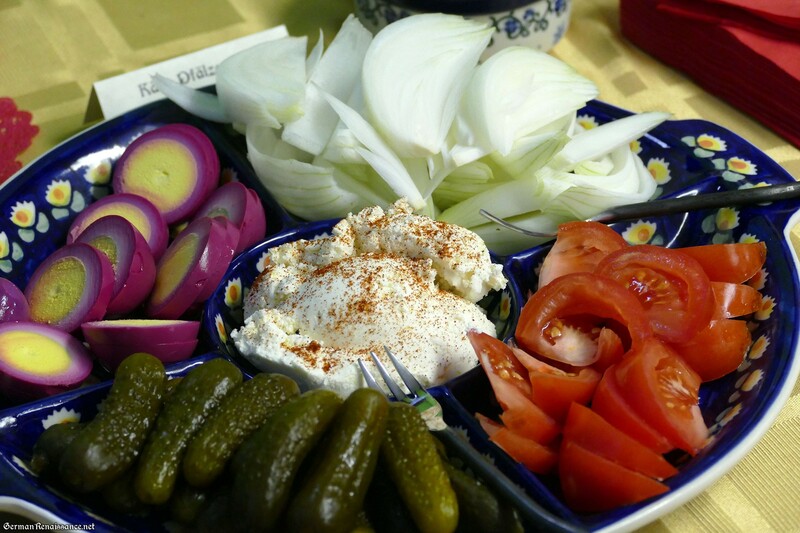 But plain is good, too! 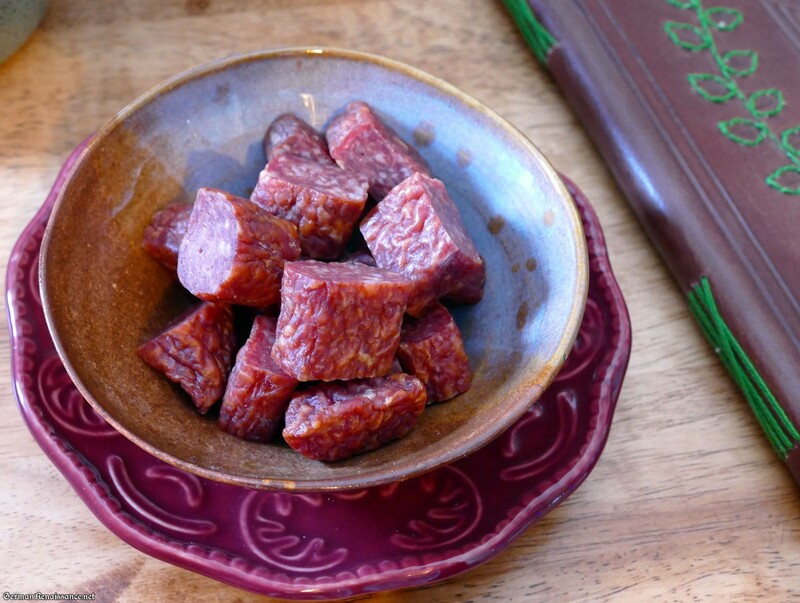 It should last about two weeks in the refrigerator, and softens at room temperature. 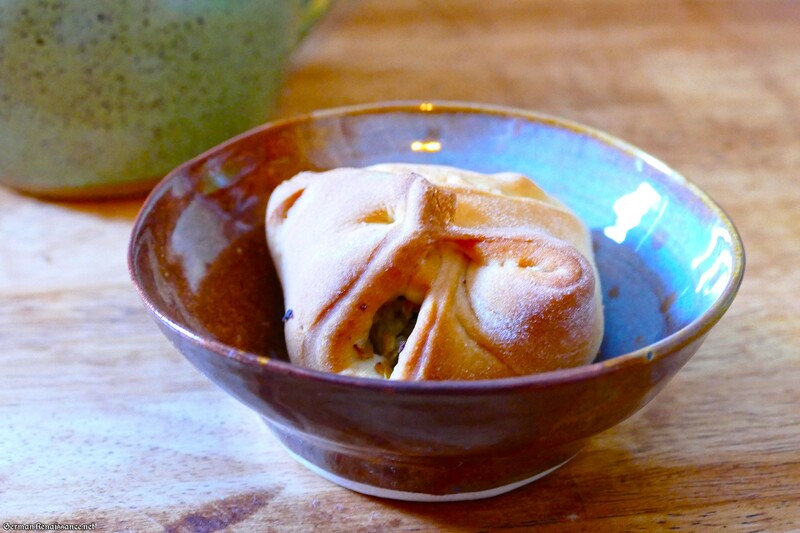 It will get less and less creamy over time,” says Hannah. 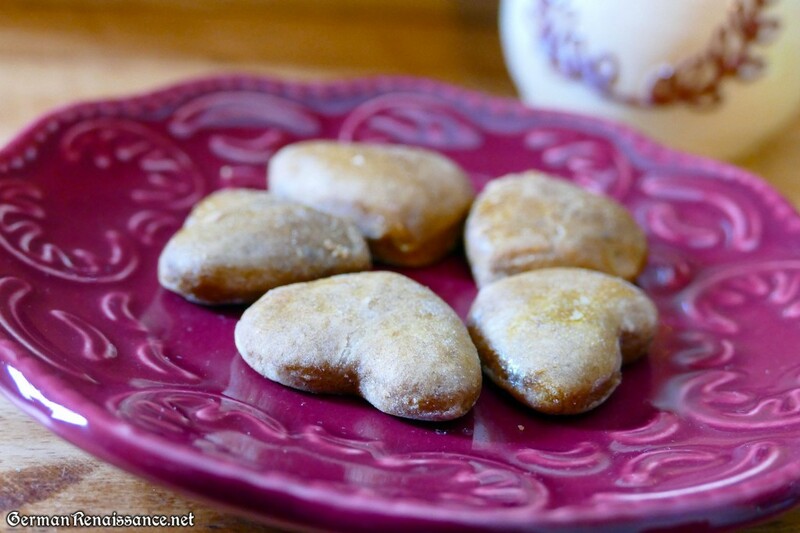 I was gifted with what remained of the treats, and we’ve been nibbling on them ever since. 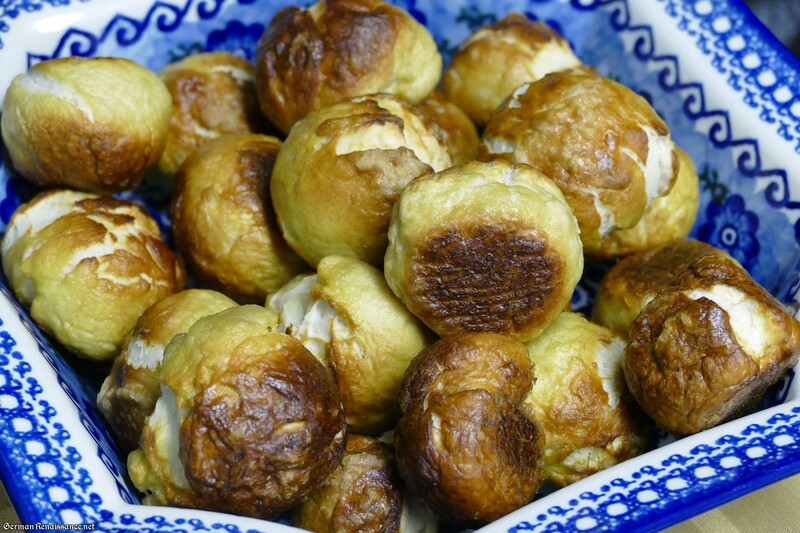 I can attest to the fact that they are just as delicious! Many, many thanks to Baroness Hannah Schrieber, Lady Ilse Strauss, Lord Uillec MacLamont, Mistress Helena Sibylla, The Honorable Lady Katherine Hatton Rames, and Alexander von Lübeck for everything they did to create this delight of the senses. 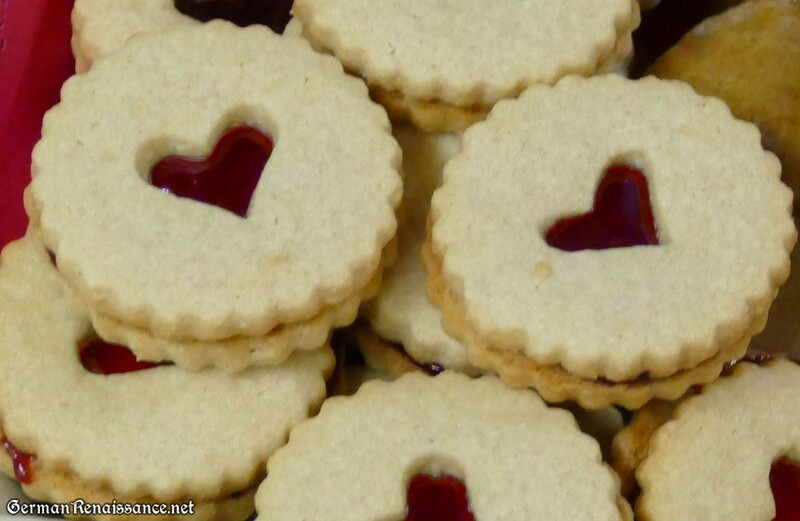 I know my vigil visitors enjoyed these treats as well, not only from their comments but also because someone was always at the table whenever I got a glimpse of the outside! 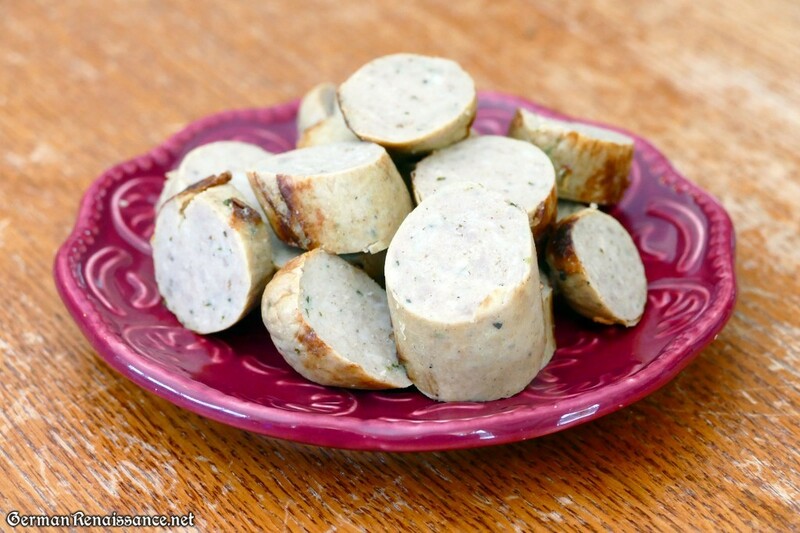 I also heard, from behind the stout, wooden door to my vigil chamber, folks calling for “sauerkraut balls” several times! 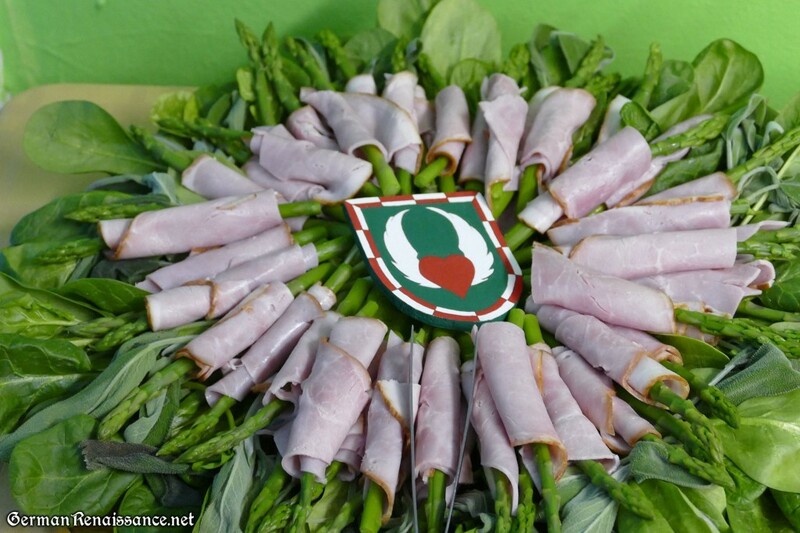 * I don’t believe I’ve mentioned it on this blog yet, but I was placed on vigil to join the Order of the Laurel in January 2016. Read the story here. Drawn thread work likely began in the 16th century and was popular in Italy, Germany, Sweden, and England. 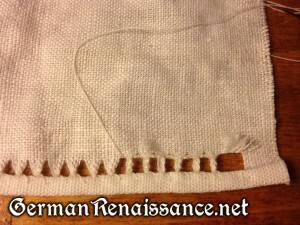 I discovered it while researching pleated aprons and I theorize that some German aprons utilized drawn thread techniques based on imagery. Drawn thread work can be seen in a simple form on the 1567 Nils Sture shirt (in the Cathedral Museum) and in a much more elaborate forms beginning at the tail end of the 16th century. Drawn thread work is also sometimes referred to as cutwork, pulled thread work, Punto Tirato, or whitework. 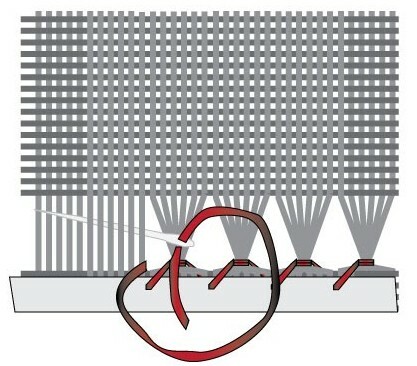 The defining technique of drawn thread work is that some warp and or weft threads are drawn (removed) from the fabric. 1. 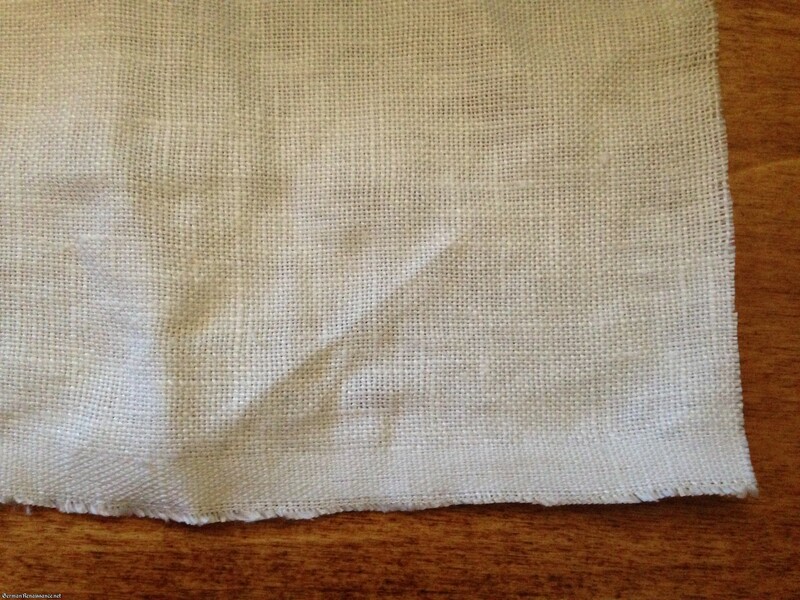 Prepare your linen by squaring up your edge(s) evenly on the grain. This is typically done by drawing one thread very near to the edge and then cutting off the excess (here’s my tutorial on how to square linen). 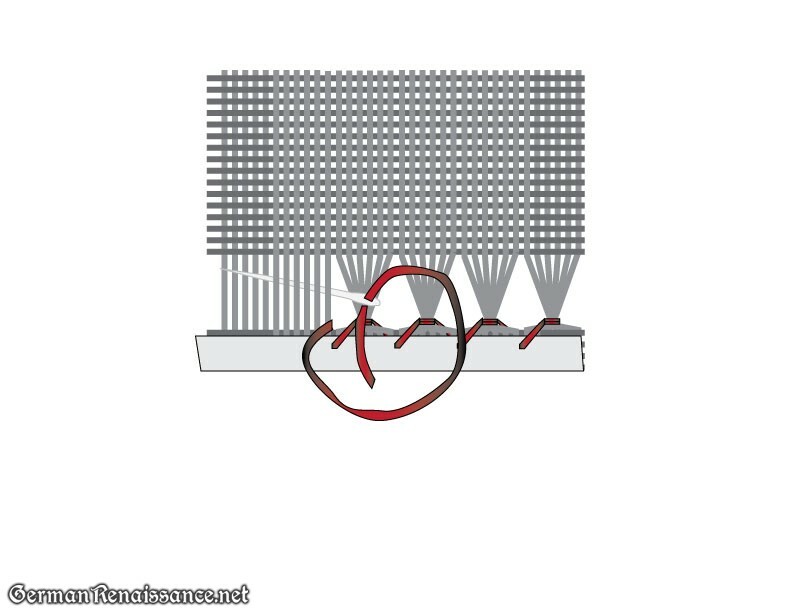 In this tutorial, the warp threads are the horizontal threads and the weft threads are the vertical threads on the fabric shown in the photos. 2. Calculate the width of your hem (1/8″ or 1/4″ is typical), multiple that number by 3, and mark that point at the corner of one edge. 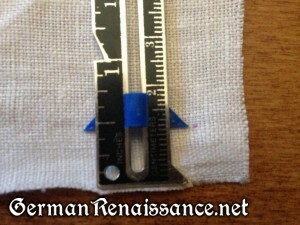 For example, if I want to make a 1/8″ hem, I measure 3/8″ from both edges at one corner and mark it clearly. 3. At the point you marked in step three, gently cut one warp thread — and only one thread — as shown below. 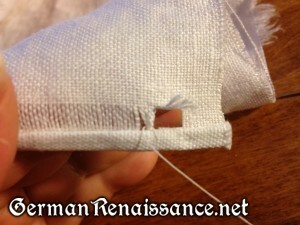 You can use small, needle nose scissors as I do, or you can use a seam ripper. 4. Gently tug the warp thread you cut (it may help to use tweezers here) until the fabric gathers along most of the edge, but do not pull it out yet. Stop pulling when you see the material gathering or tugging about 1/2 inch from the opposite corner. 5. Following the tugged thread all the way to the other corner, measure the same distance you marked in step 2 (i.e., 3/8″), find the point at which your tugged thread meets that point, and snip it. 6. 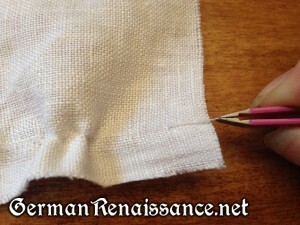 Pull the thread out along the full length of your fabric. Tip: Most linens you can buy today have rather weak threads that tend to break while pulling, which leads to frustration and fuzzed threads in your linen. If you encounter this problem, try pulling out shorter sections of thread by snipping the tugged thread at intervals along your fabric. The easiest way to do this is follow the tugged thread and then use something like a needle to pull it up a bit (as shown below), then insert your scissors and snip. Now you can pull that thread and it is less likely to break midway. 7. If you wish to remove more warp threads, which I recommend for this tutorial, snip the warp thread(s) at the two ends just above where you removed your first warp thread and pull out the thread(s). 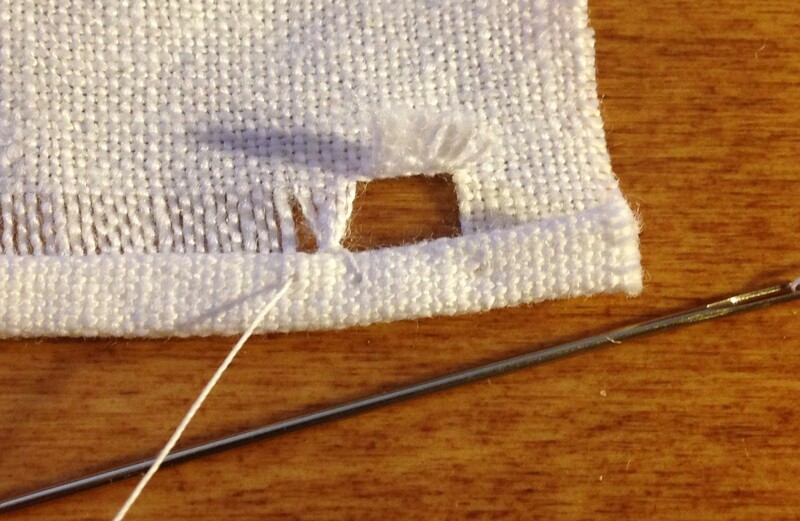 It’s much easier to remove threads once you’ve got the first one out. For this tutorial, I removed 8 threads. 8. 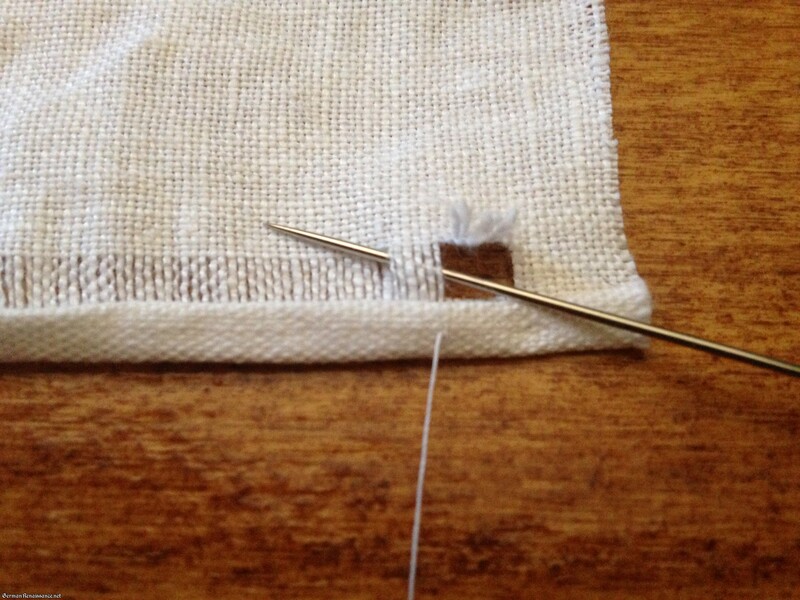 If you plan to hem the other sides(s), you should also snip the same number of threads going in the other direction. For now, you can snip them at the bottom and allow them to stay to pull later. 9. Fold your hem twice so that the top edge of it is in line with the bottom edge of pulled threads, as shown in the photo above. 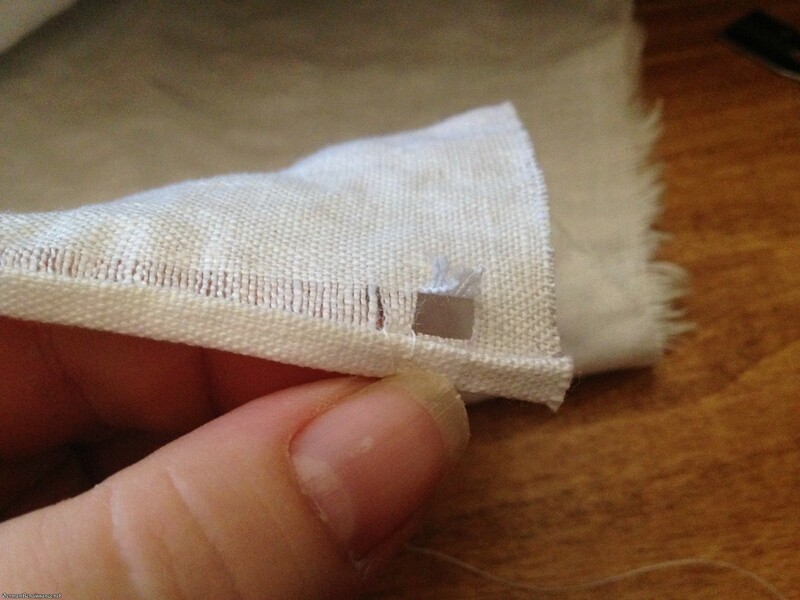 Press the hem with your fingers and it’ll likely stay in place without pins. 10. 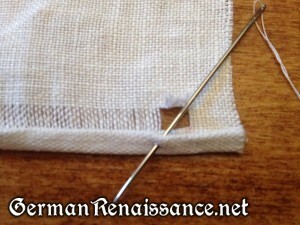 Prepare a needle with waxed thread and knot the end. Insert the needle in the hem, just to the left of the area without any warp threads. 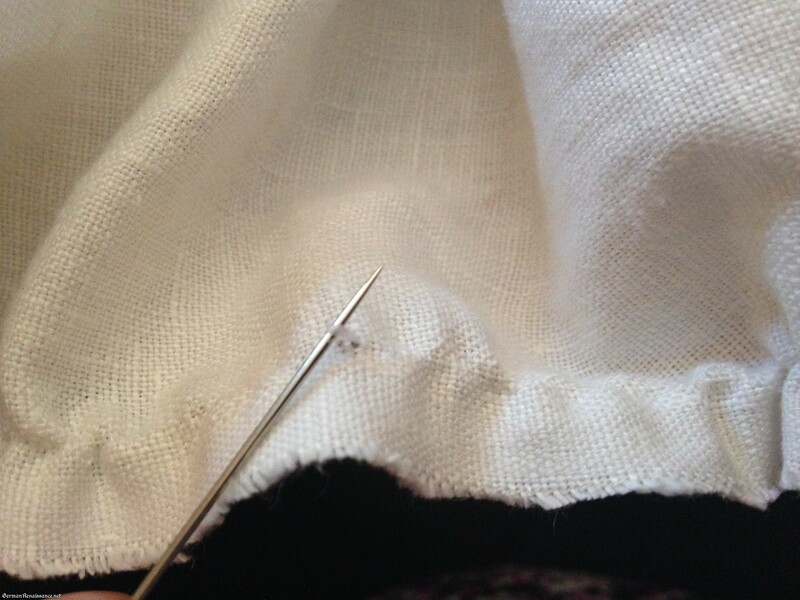 Pull the needle through the fabric, making sure the knot stays in the fold of the hem. 11. Place your needle behind several of the warp threads. For this tutorial, I recommend exactly six threads. 12. 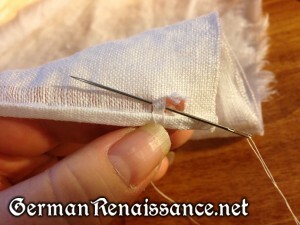 Pull the needle through to the front, making sure to keep the thread toward the bottom of the hem as shown below. 13. Insert the needle again as you did in step 11. Notice how I am holding thethread toward the bottom with my thumb. 14. Pull the needle through and gently tighten the threads so that the weft threads are pulled tightly together at the base, but not so tight that the material bunches. 15. Insert your needle in behind the hem and out again to secure your hemstitch. Note: Rather than use a knot on the end of your thread when you begin this stitch, start by weaving your needle a bit through the threads above the area you’ll begin working with and then stitch over it as you go along. Later you can snip the end of the little tail and no one will be able to tell where you started. To end this stitch, weave your thread back through threads of the linen and completed stitches along the edge, then snip off. To turn corners, snip the folds of the hem at the corner (to reduce bulk), then fold up the hem on the adjoining side, press with your fingers (or pin), and use a button hold or satin stitch around the corner square to secure it in place. 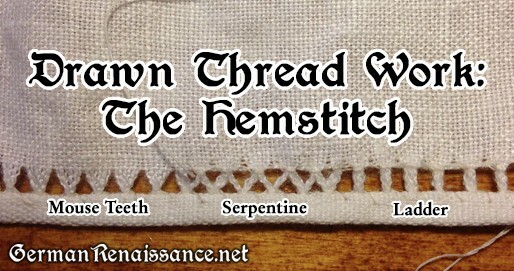 You can do hemstitch on as little as one pulled thread or as many as a dozen or more — it all depends on the look you want and the weight of your fabric. Hemstitching can be done without needing to be right on the hem, which means you can also stack lines of hemstitching for a more complex look. 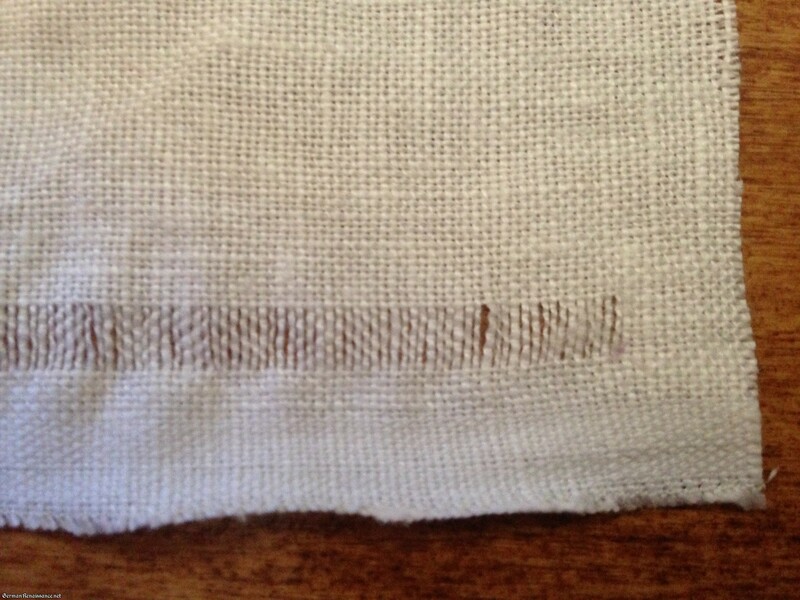 In the 1569 Nil Sture shirt shown below, you can see how there are three stacked lines of hemstitch, with the two outside lines being smaller (fewer threads removed) than the inside line. Drawn thread work can get much more elaborate. If you’d like to learn more, I highly recommend the free book, Drawn Thread Work in the Antique Pattern Library. You can download the full book as a PDF. The gather method of creating pleats involves sewing evenly-spaced running stitches in parallel lines to one another and then pulling the threads to gather the material into folds. 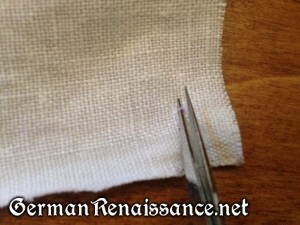 This method is generally accepted as the most likely method of creating small pleats in linen in renaissance Europe. The gather method allows one to precisely control how wide and deep one sets the folds, allowing for the very fine folds seen in 15th and 16th century European portraiture. 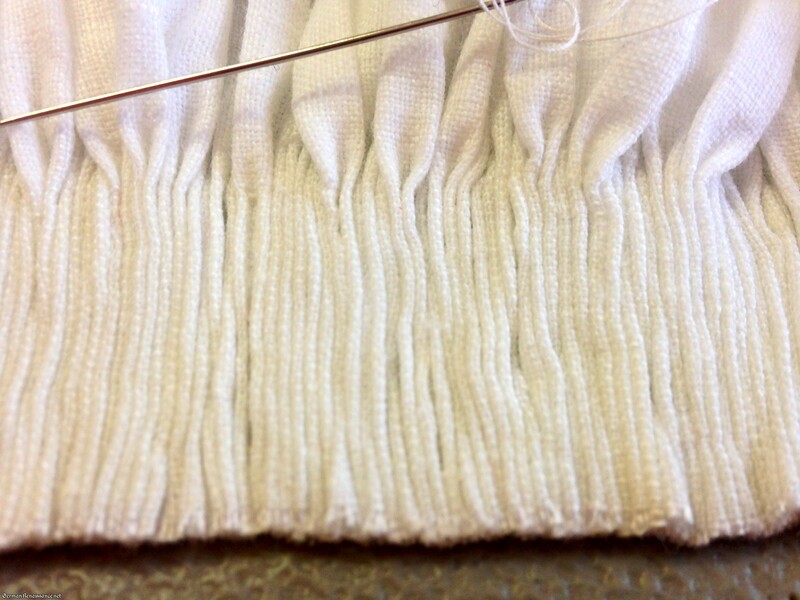 When the threads are pulled, the fabric gathers neatly, as shown below. The tighter the threads are pulled, the tighter the fabric doubles upon itself, which you can see in the next illustration. A top view of the evenly-stitched thread(s) pulled tightly and the fabric folded upon itself (Illustration copyright Genoveva von Lübeck). 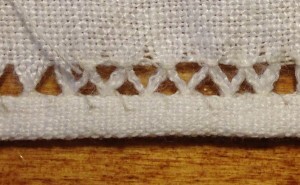 While it is not essential that the stitches be evenly spaced in the running stitch, it is important to note that if parallel lines of stitches are used (for longer folds), the stitches must exactly mirror the parallel stitches below and/or above it in order for clean, straight folds to form when the fabric is gathered. If an uneven running stitch is employed (see fig. 6), the bulk of the fabric’s folds fan out on one side of the fabric (see next two images). This results in a less stable set of pleats that are later difficult to secure. 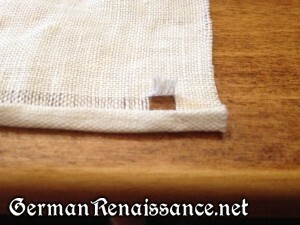 While we cannot know for certain whether or not an uneven running stitch was employed in the 15th and 16th centuries, we can glean important information from Find 121 at Castle Lengberg (Nutz, 83). 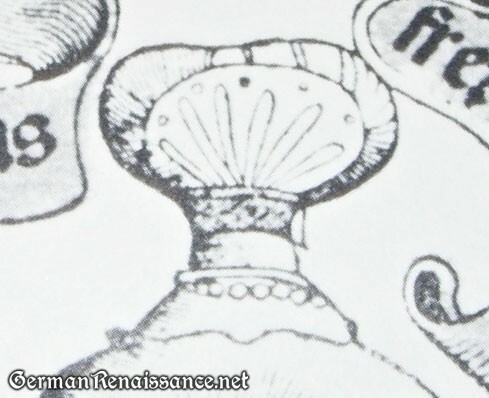 In Find 121, the top of the fabric, near the pleating, is pointed, as shown in the illustration below. This may seem confusing until one considers the usage of this fabric and its context with the whole shirt. The pointed edge of the pleated fabric is encased in a fabric casing. 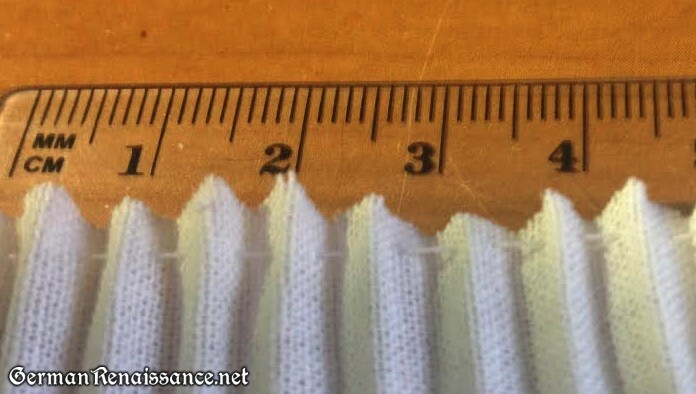 One can theorize that the sempstress trimmed the edge of the pleated fabric before adding the casing, and if one compresses the fabric and cuts it at an angle (which is more likely to happen with the very large amount of fabric gathered in the pleats), the result is a zig-zag. 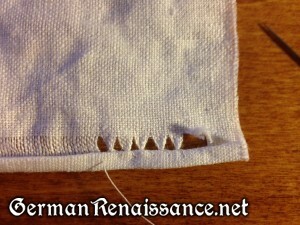 The pointed edge would have also have minimized fraying. 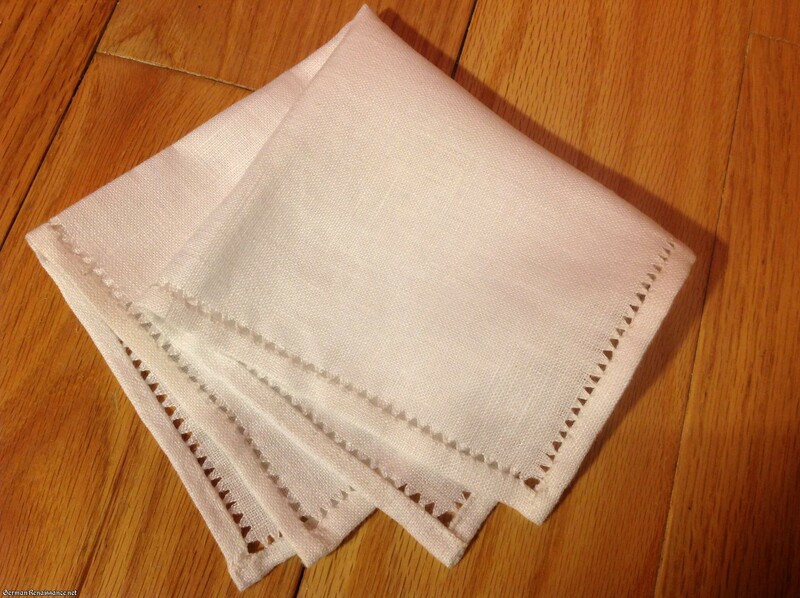 This theory was attempted with a piece of linen that has been tightly pleated and the effect was similar to Find 121 (see photo below). 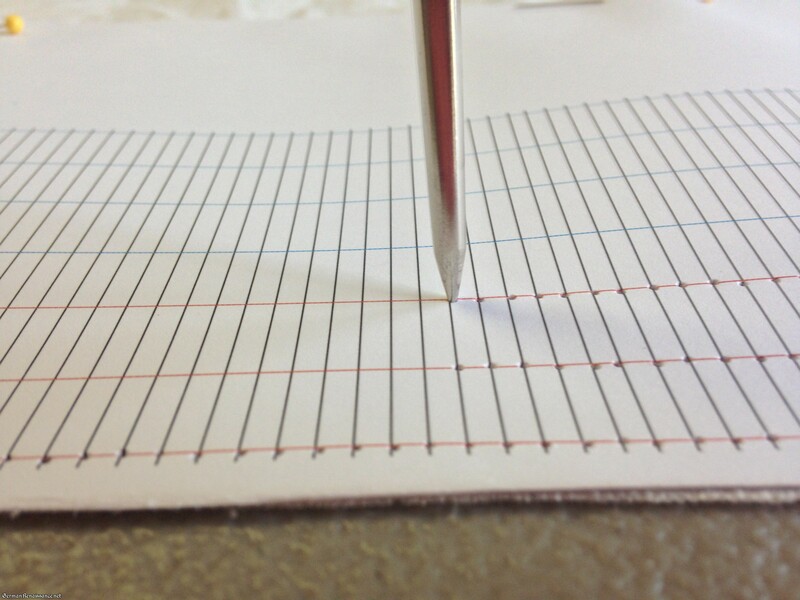 Points formed after cutting the edge of pleated fabric at an angle. While the pointed, zig-zag effect could come from a pinking tool, it does not seem likely as the points of the fabric correspond to the sharp edge of folds exactly in Find 121. What this pointed fabric could reveal is that the folds were densely and evenly folded when cutting, which would be significantly more likely with evenly-spaced stitches creating the folds than unevenly-spaced stitches. 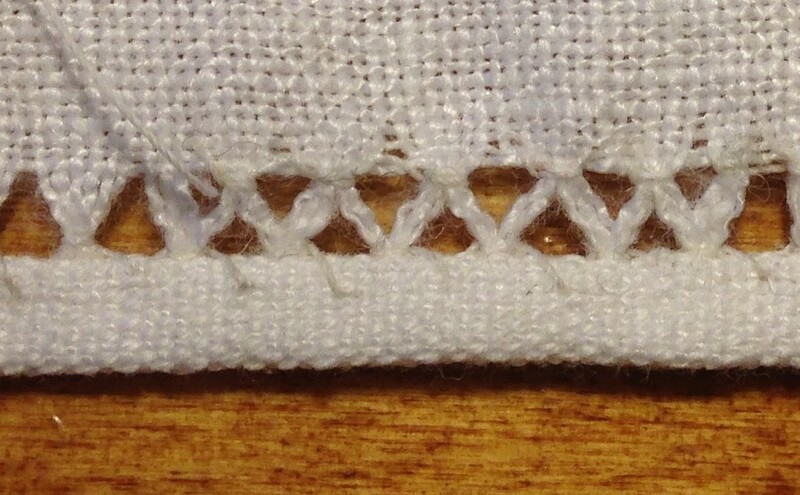 Additionally, the trimming strip attached at the top of the fabric of Find 121 employs evenly-spaced running stitches as well. 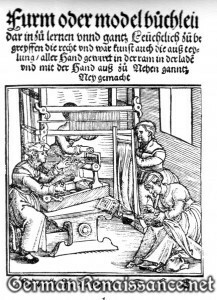 From the evidence available for Find 121 from Castle Lengberg, it is probable that a combination of the Gather Method and the Press Method of folding the fabric was historically used. The Gather Method may have been used to create the very tight and even folds, and then the Press Method may have been used to compress the folded fabric (perhaps while wet) with a slickenstone or a press to form the sharply-ridged pleats. 1. 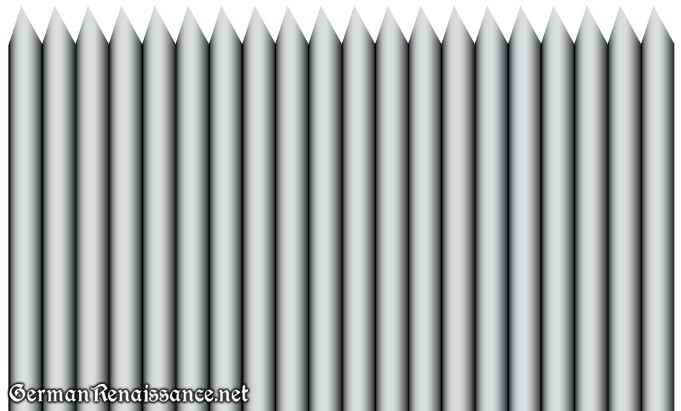 AWL PRICK: Prick the fabric with something pointy, such as an awl, in an evenly spaced grid pattern. You can make your own grid pattern in the spacing you want, or use one of my pre-spaced grid patterns: 1 inch (very large and ideal for beginners), 3/4 inch, 1/2 inch, and 1/4 inch (the most historically-accurately size). 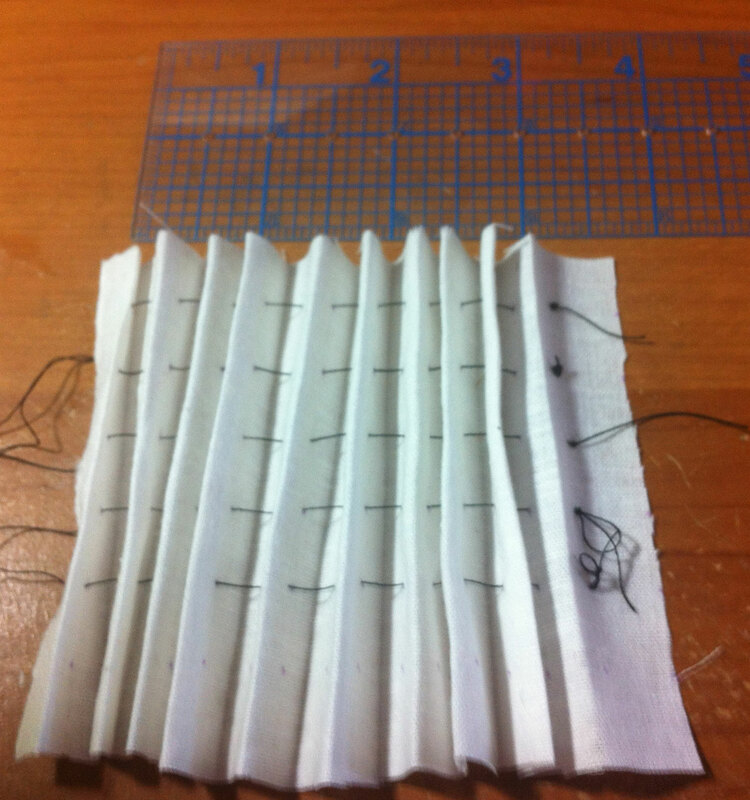 There are variety of ways to sew the running stitches so you can gather your material into pleats. * There is an alternate method called “picking up the dots” where you push the needle on one side of a marked hole/dot and out the other side (see the fourth, fifth, and sixth illustrations at the start of this section above). This method results in an uneven running stitch, which may or may not work well for you as it produces a lopsided gather that is less stable. I do not use this method in my work as I prefer more precision. I do not currently have evidence that this method was used historically, but I haven’t ruled it out, either. B. 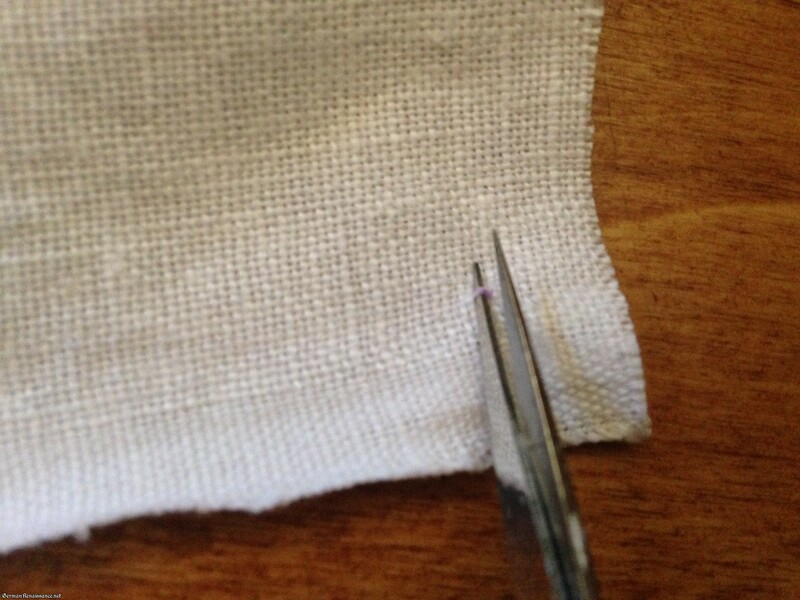 COUNTED: If you didn’t mark your fabric first, you can count the threads in your linen and sew your running stitches exactly straight on the grain and an exact number of threads from one another. 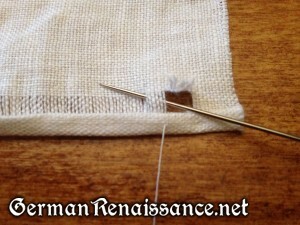 Be sure each row of running stitches is one length of thread and one length only. When done, pull on all threads to gather the folds. C. NEEDLE LENGTH: If you didn’t mark your fabric first, you can use your needle as a measuring tool to judge the distance between running stitches — you may wish to mark you needle with a pen or a piece of tape for a consistent distance each time. Be sure each row of running stitches is one length of thread and one length only. When done, pull on all threads to gather the folds. 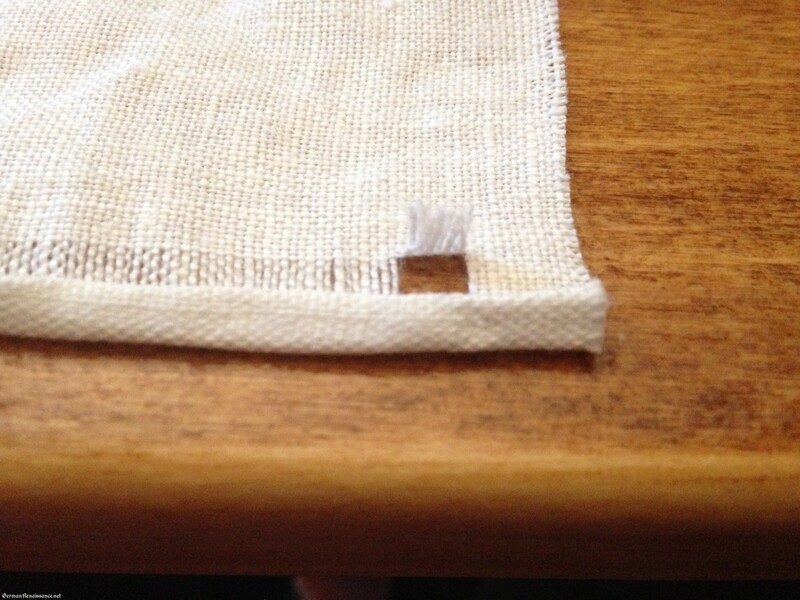 D. EYEBALL: If you didn’t mark your fabric and aren’t concerned with your stitches being the same distance from one another, you can just eyeball the running stitches. It’s a bit messier, but that is sometimes fine for certain things. What’s most important with each subsequent and parallel row of running stitches line up with the previous rows so that when you pull the threads to gather the pleats they fold neatly. Am I missing any methods for marking or gathering? Let me know in the comments! In addition to folding pleats into fabric, you can also press them in using a variety of techniques. 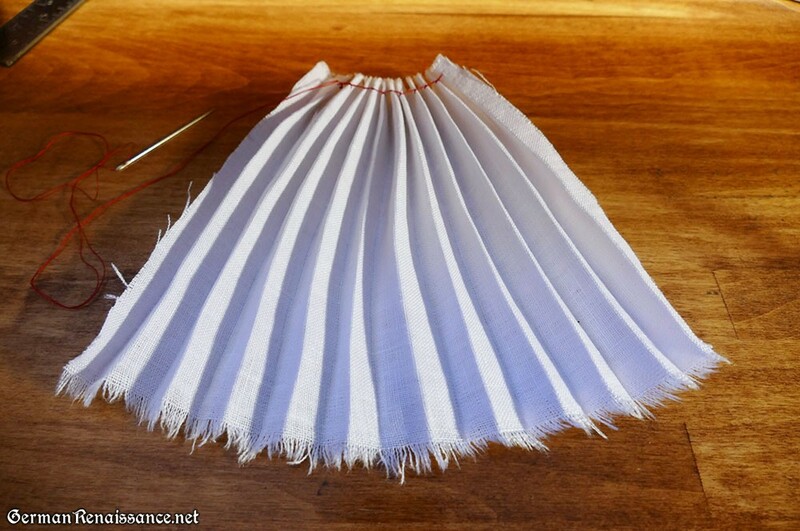 No manual from the 15th or 16th centuries is known to exist that explains the press folding method of creating pleats, so it is unclear if the sempstresses of this era would have employed such a method to pleat their cloth. 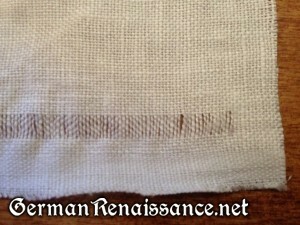 However, we can make some educated guesses based on the extant pleated fabric found in Castle Lengberg—specifically, Find 121 ( a section of pleats from a shirt sleeve cuff created in the late 15th century) was found to have a sharp pleat edge which may have caused the cloth to break along the edges of the linen as it dried over time (Nutz, 81). 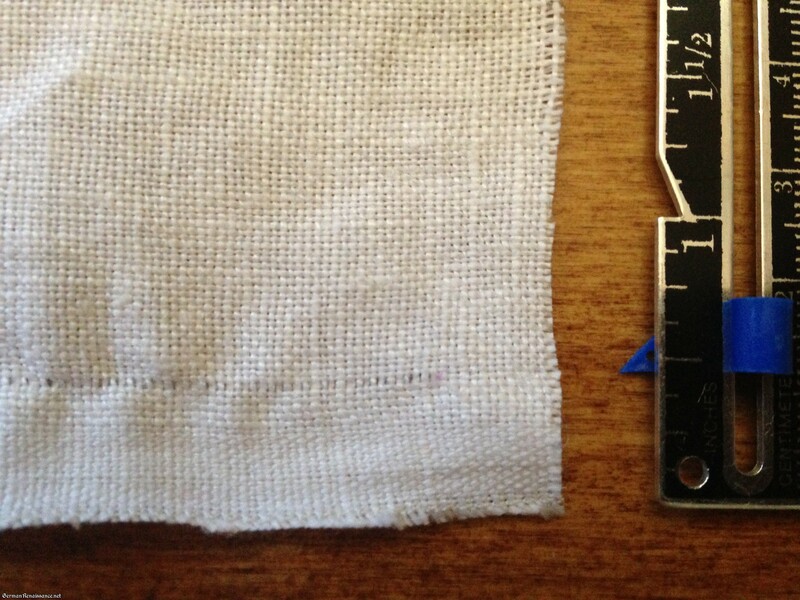 An edge sharp enough to break the linen fibers over time would likely need to be pressed into the linen with something like a smoothing or creasing tool, or perhaps a frame that tightly compressed wet fibers. 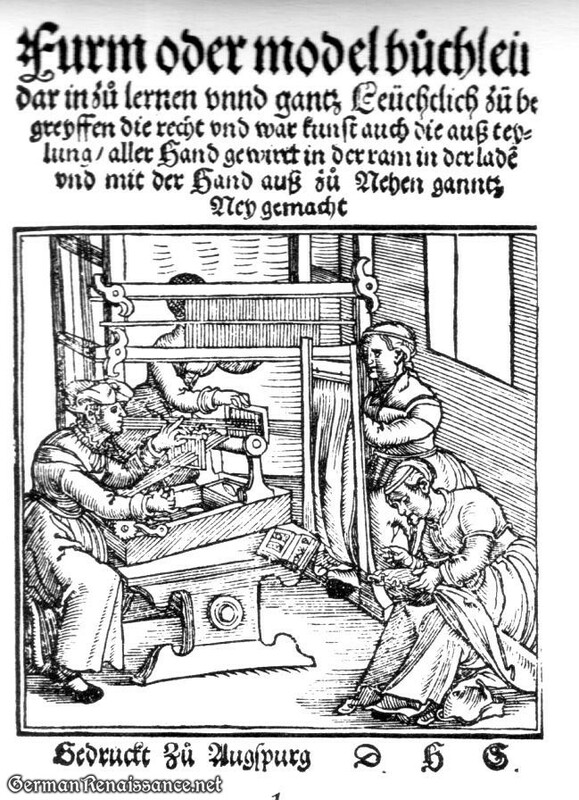 One possible tool which could be used to fold the fabric is shown in the image below from the cover of Furm oder model büchleini, which depicts a frame with what appears to be pleated and secured (pressed or clamped) fabric. No extant frames which visually match this description are known to exist, however, so it is not clear how this tool functions (and I suspect it has an entirely different function in pleatwork–more on that later in the guide). 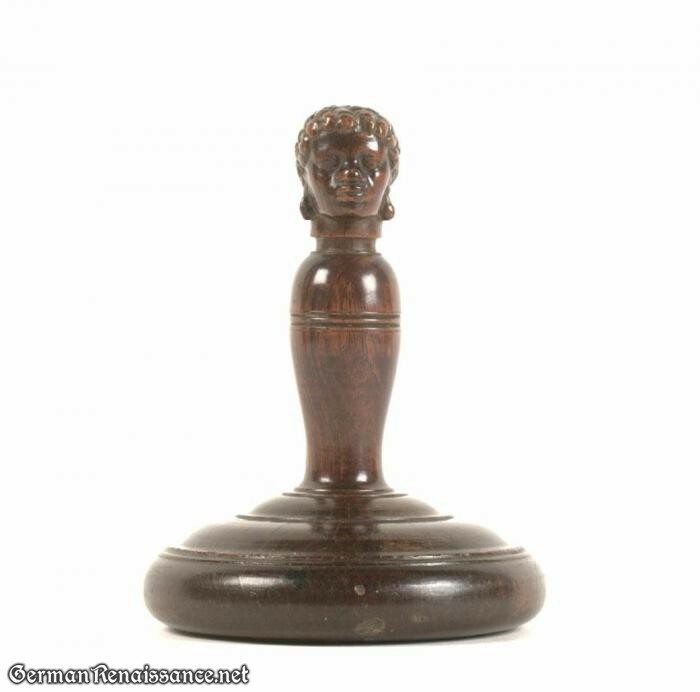 Another possibility for pressing the folds into the linen may have been the wooden or marble slickenstone (similar to the one shown below), or linen smoother, which was used to smooth creases out of damp linen after it had been washed and starched. 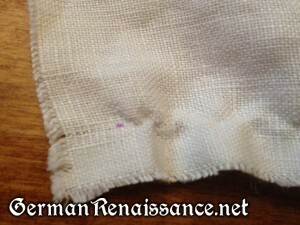 The same tool that could remove creases would have been able to add creases if the fabric was damp and folded. Recently I tried to construct a device that would press the folds into a piece of linen. 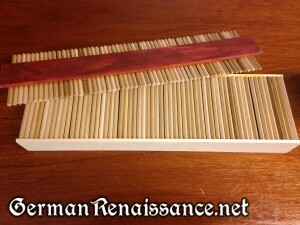 It was a board made of ridges of wood, set at 45 degree angles, upon which you placed a piece of wet linen. 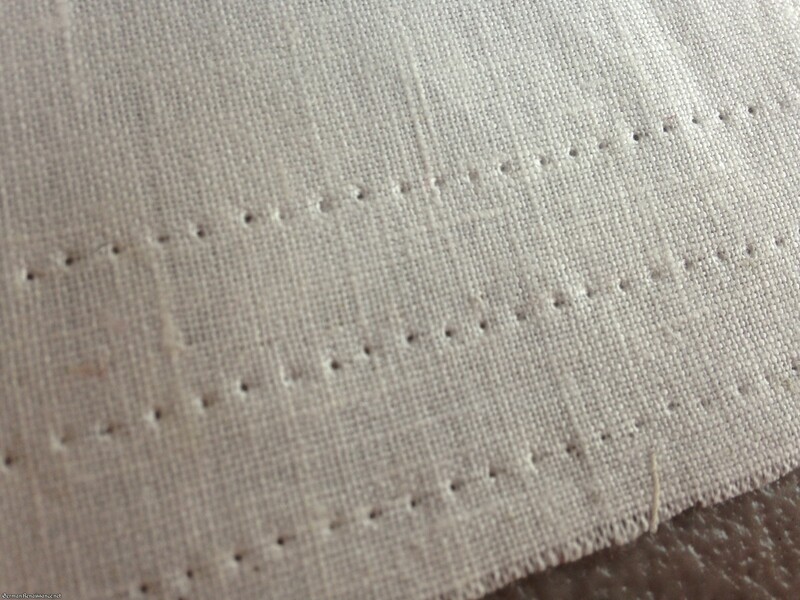 Then a second ridged board was placed on top of the linen, perfectly matching the board below. The idea is that you would press the two boards together to create ridges in the fabric and as the linen dried the ridges would become more or less permanent folds and could then be sewn together to secure them. 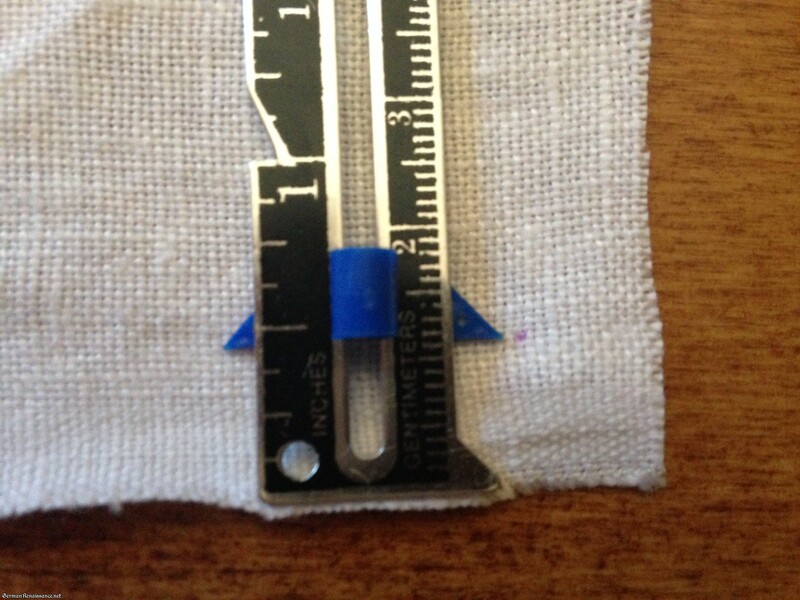 This experiment was a failure, however, because the tension of the fabric is so strong that it does not fold when the ridged boards are pressed into it. It’s possible that if the top set of ridges was made to be flexible that you could manipulate the fabric into the press better, but a flexible set of ridges seems a bit too unlikely for our ancestors to have fiddled with. I am still considering ideas for it, though. Update: Thanks to a reader (Sarah), I’ve since learned that the Egyptians liked to pleat their clothing. A finely pleated tunic is still in existence in the Louvre. It’s unknown how the Egyptians pleated their cloth, but one theory is that carved, ridged boards like this one at the Museo Archeologico Nazionale (inventory 2691) may result in a pleats if wet, starched fabric is pressed onto it. 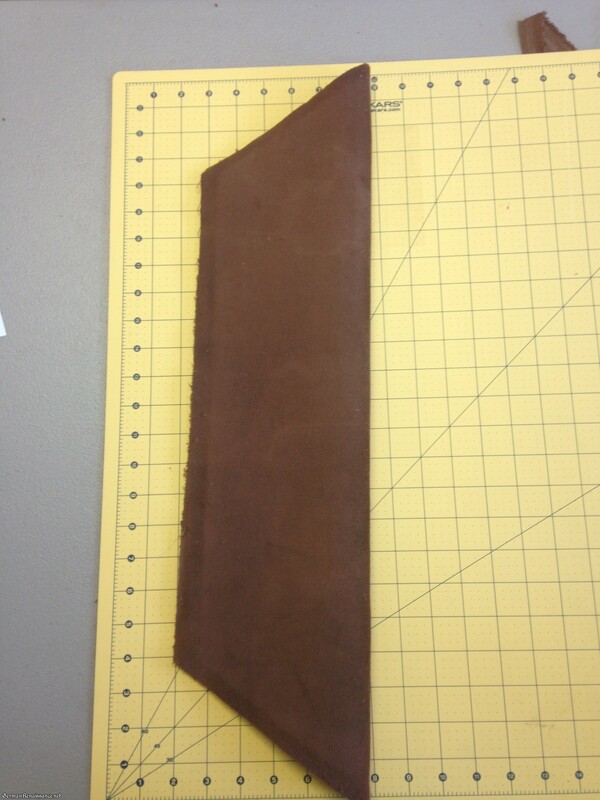 It looks similar to my failed pleating press, except it is just one board, not two. Thus, I think my pleating press deserves more testing. 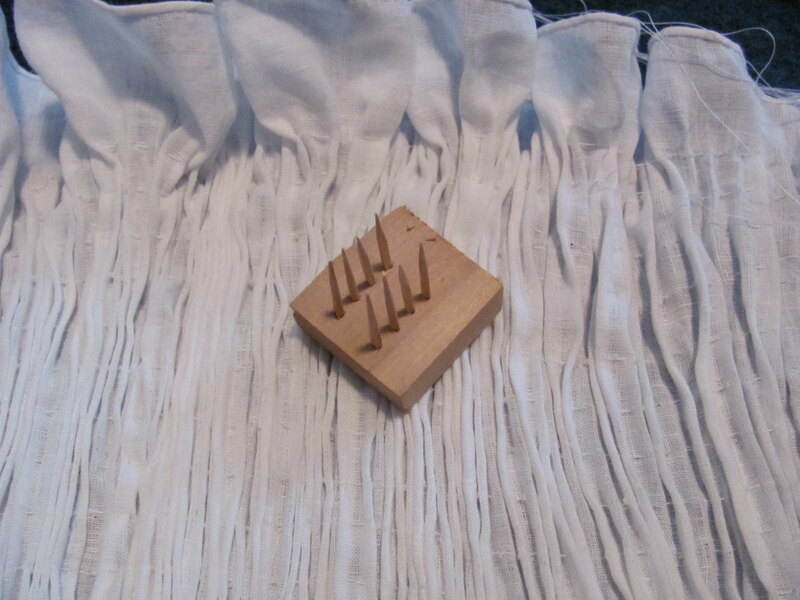 This article on “Costume in New Kingdom Egypt” (Sasson, 1995) theorizes how Egyptians may have used this pleating press, and even comments that tests were undertaken with them. There is another modern method of pressing folds into cloth, used today by couture fashion workers. They have a device called a Pleater (or Pleating Board / Pleating Press) which involves folding fabric (usually polyester) around a sort of flexible, accordion-style frame and then heated in some fashion (you can see it in action in this video). This doesn’t seem likely to be a 15th or 16th century practice because of the frame’s need to be flexible and the fact that this works best with man-made fabrics, but I thought it worthy of mention here for the sake of completeness. If this method is appealing, you can make one yourself with this tutorial. Material can be pleated in a variety of ways. 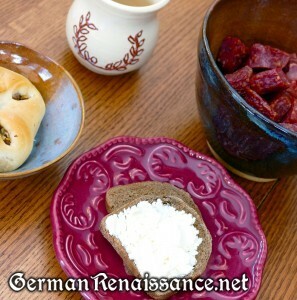 The most basic method, and likely the very first method our ancestors ever employed, is to simply fold the material. 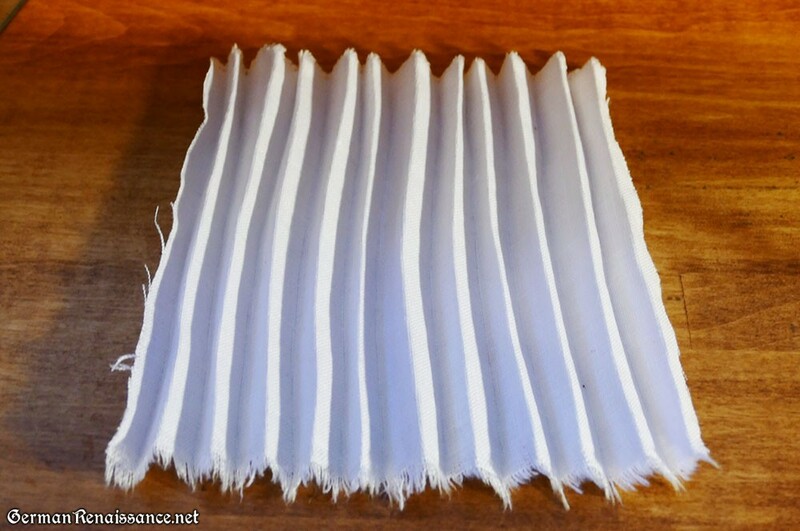 Let’s look at the research and the actual practice of pleating material using the Fold Method. Research: Some undergarments were pleated with the fold method, which involves doubling the material upon itself and then pressing, pinning, or stitching in place. 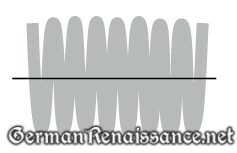 Evidence exists to suggest that this method was employed in pleated garments based on the Castle Lengberg finds, specifically Find 273.14 which is a small fragment of a pleated sleeve or neckline with a bit of its trimming strip missing. 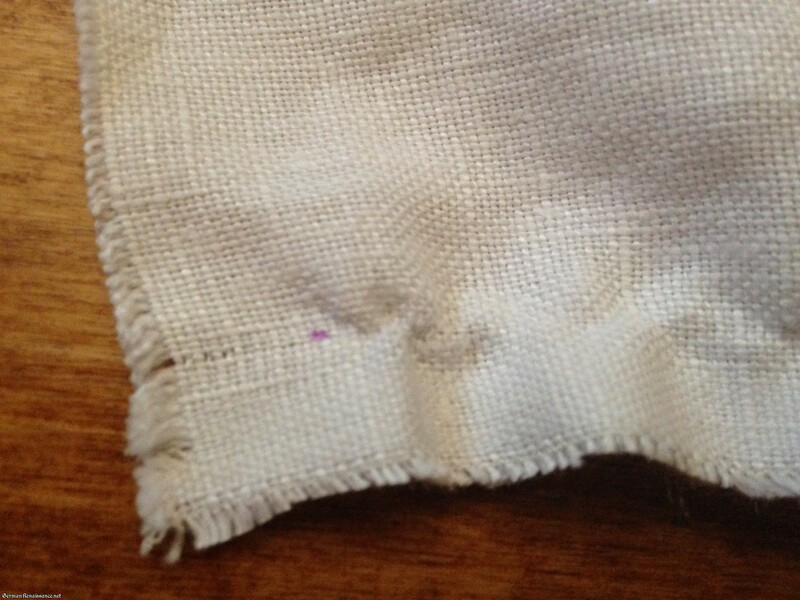 The raw edge with the missing trimming strip shows indications that the linen was folded at regular intervals (Nutz, 81) and no gathering thread was found. Find 273.14’s pleats were spaced three centimeters (1.2 inches) apart, however, which is very large. 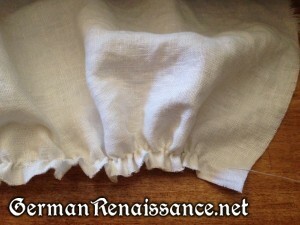 While one could create folds in this manner, it produces less-consistently spaced folds and would likely not have been used for shirts with very fine folds (such as those in Find 121 from Castle Lengberg, a section of pleats from a shirt sleeve cuff created in the late 15th century). Illustration of pleated fragment made with the fold method (copyright B. Nutz). Tip: If you use the fold method to make your pleats, you’ll probably want to iron them to keep them folded as you work on securing them. 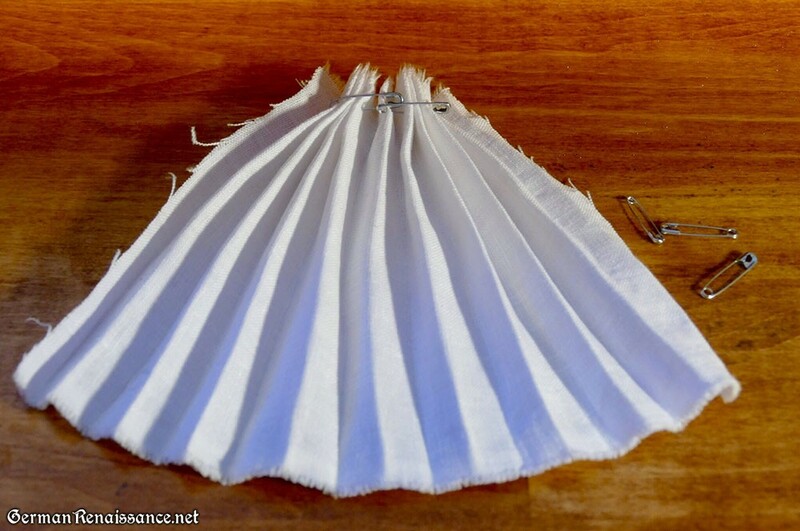 If that doesn’t seem like enough, consider using white vinegar to keep your pleats folded. 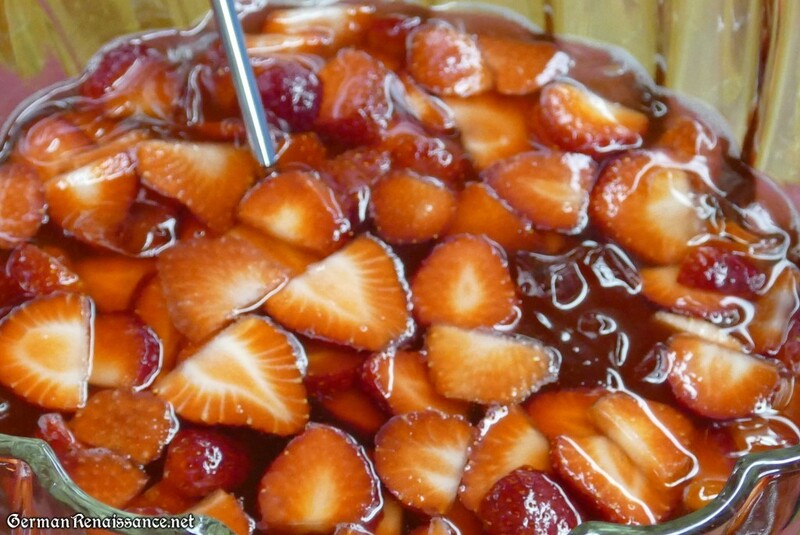 To do this, spray a pressing cloth with a 2:1 water/vinegar solution, iron well on the proper setting, then allow to cool. The vinegar chemically sets the folds. Note: Folded pleats are quite common in outer garments. 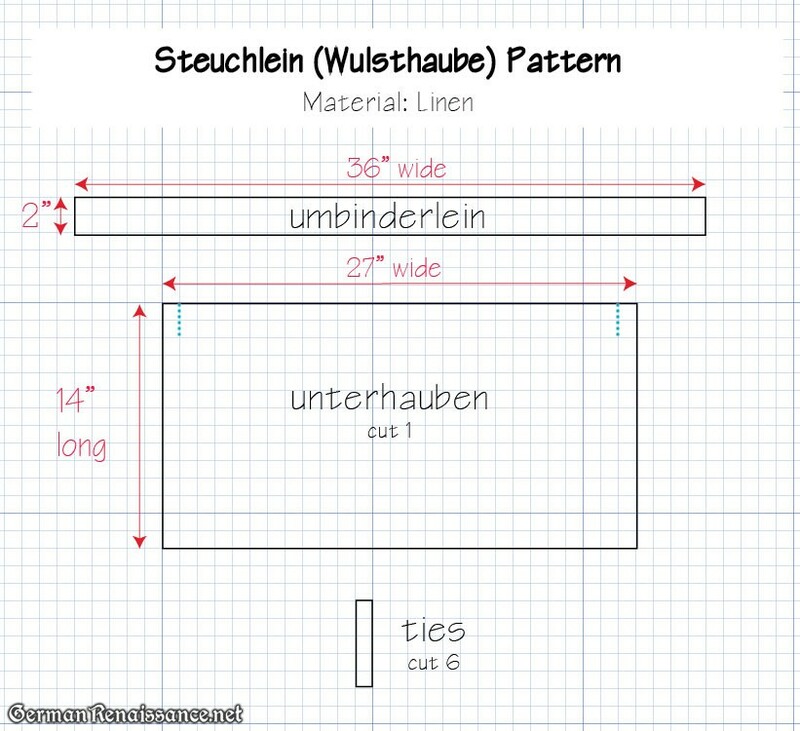 If you’re looking for a method to make rolled pleats for a skirt, please see my Rolled Pleat Tutorial and Calculator. 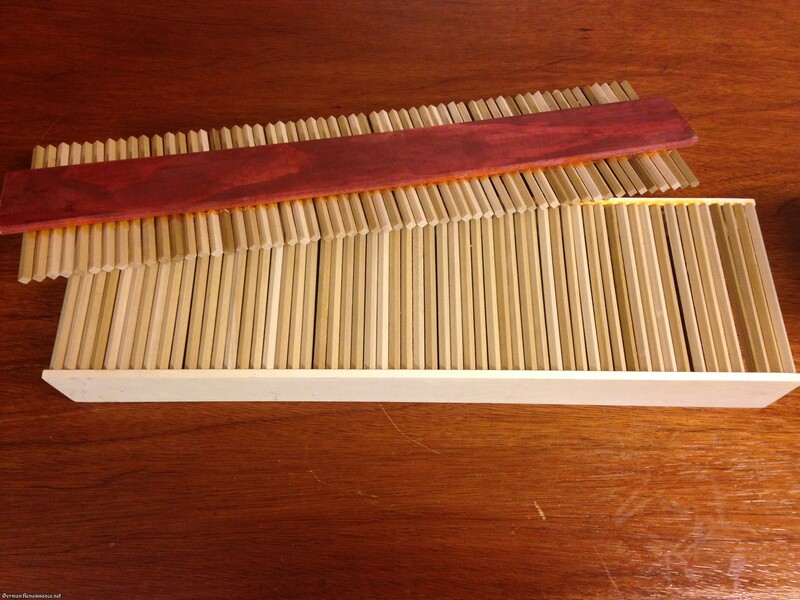 Cartridge pleats are made using the Gather Method, discussed elsewhere in this guide. 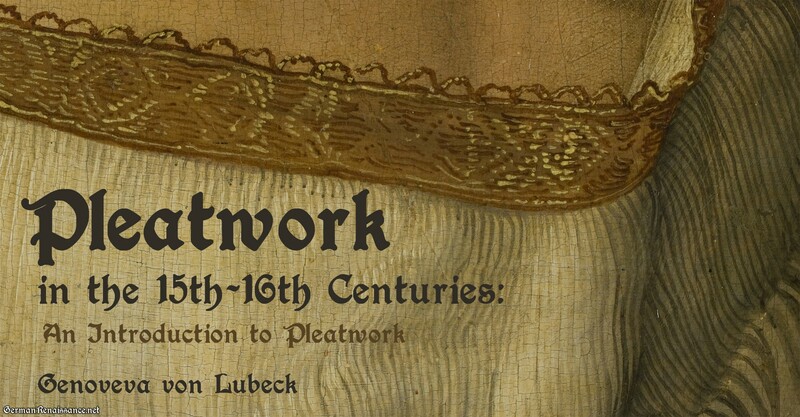 Preface: I’ve been studying pleatwork (known modernly as smocking) for several years now. In 2014 I wrote a research paper called “Techniques of 15th and 16th Century Pleated Undergarments” which discussed the nature of pleatwork and the various stitches that create and secure it. I didn’t put the paper online, however — instead, I fussed over it. Well, it’s time to share my research. This is the first of many posts about pleatwork. It’s not my research paper, but it contains much information pulled from it. For early modern Europeans, life was not too short to fold their underwear. As the “Little Ice Age” crept into 15th and 16th century Europe and access to materials increased, underwear became bigger, cozier, and, in some cases, fancier. 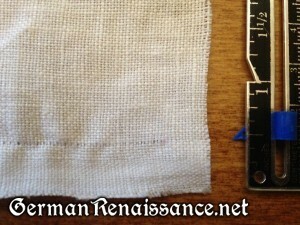 The linen undershirt, known in the German states as a hemd, began to employ a larger and larger amount of fabric, which needed to be gathered and secured at the neckline and wrists. One solution was to gather the fabric into small corrugated folds, also known modernly as cartridge pleats, and then secure those pleats in place. 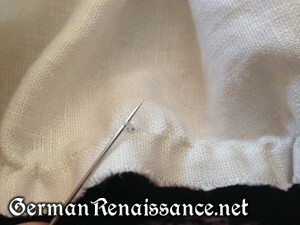 An analysis of 15th and 16th century undergarment pleating and recent research reveals important fabric gathering and fold securing techniques: fabric was corrugated and secured in different manners and gathering threads, when employed, were not used as the sole means to secure the finished work. 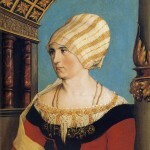 Pleating fabric was not a new technique by the late 15th century when the more voluminous undergarments began to appear. Evidence of cartridge-pleated undergarments appears in 21 of the 52 graves excavated in Birka (Hägg, 12) dating back to the 9th and 10th centuries. Pleats appear in other garments beyond this, as well, including the 13th century pleated wool fragment from Sankt Peder in Sweden (Kusmin), and the 14th century woman’s gown with a pleated front found in the Uvdal Stave Church in Norway (Guhnfeldt). Yet it isn’t until the late 1400s that we see cartridge-pleated garments appear regularly in surviving artwork and extant garments of the era. Renaissance portraiture is marked by innovations that more realistically portray their subjects, including attention to natural light and shadows, which is very helpful in identifying and analyzing pleated undergarments. We are fortunate to now have access to extremely high resolution scans of portraits which portray very detailed pleats, including Selbstporträt by Albrecht Dürer in Prado (1498), available at a resolution of 19,047 x 24,047 pixels in Google Earth, which is over 600 ppi (300-500 ppi range is about the limits of the human eye). 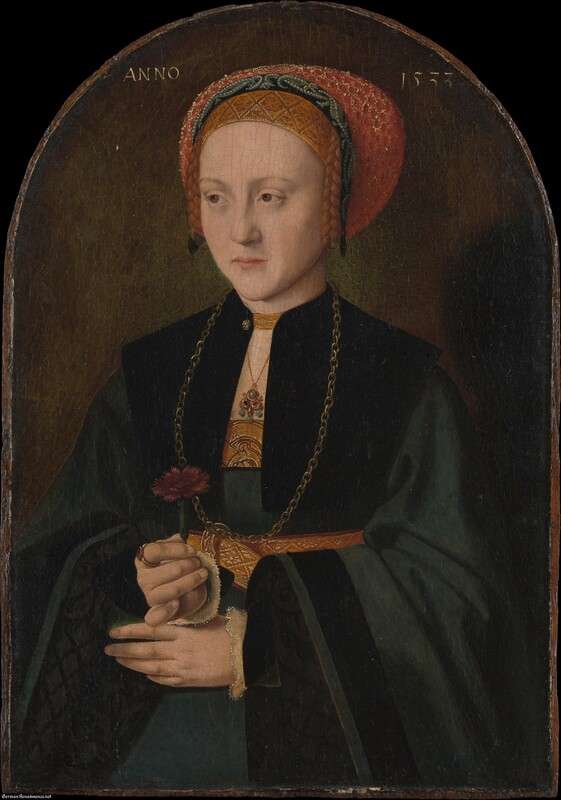 In addition to this, more highly-detailed paintings give us important clues, including Bürgermeisters Jakob Meyer und seiner Gattin Dorothea Kannengießer by Hans Holbein (1516), Portrait of a Young Man by Ambrosius Holbein (1518), and Portrait of a Boy as Saint Sebastian (1490s) by Giovanni Antonio Boltrafflo. Extant garments with pleats are few in number, but they do exist and there have been some recent, well-documented finds. Important finds include the 14 pleated textile fragments found at Lengberg Castle (Austria) in 2008, two pleated shirt fragments from Kempten (Germany) in 2011, two pleated linen shirts found in Alpirsbach (Germany) in 1958, and a pleated wool cuff dated to the 15th/16th centuries. Key to this research is an article published within the past several years in Archaeological Textiles Review, How to Pleat a Shirt in the 15th Century, by Beatrix Nutz which indicates pleating sizes and methods of securing folds. Two books, Die Ausgrabungen im Mühlberg-Ensemble Kempten (Allgäu): Metall, Holz und Texil by Rast-Eicher and Klaus from 2011 and the earlier Texil- und Lederfunde by Ilse Fingerlin, show extant textiles with three different techniques of securing folds. 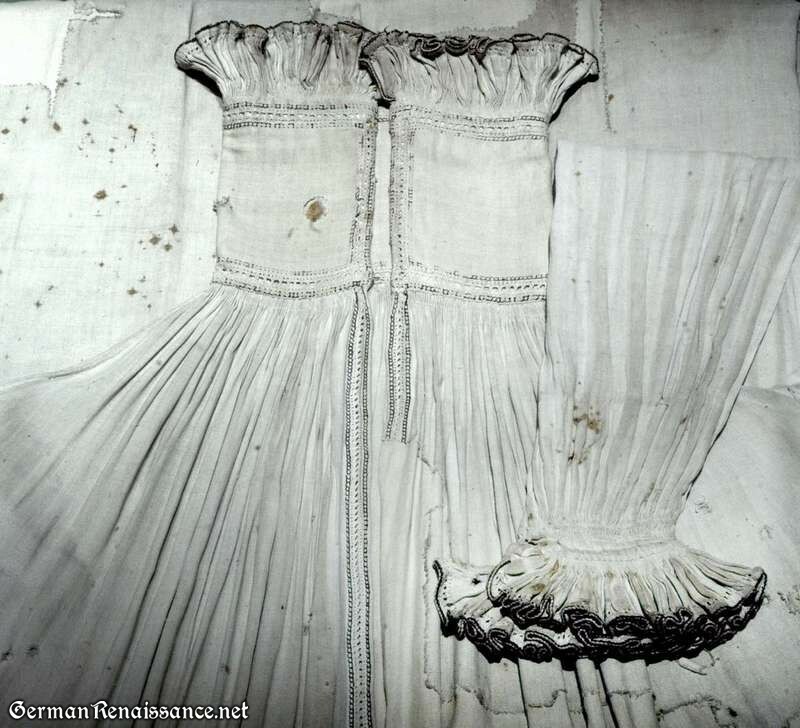 Photographs of 15th and 16th century extant garments with pleats, currently housed in museums around the world, are also helpful to a certain extent. Much credit and gratitude goes to Lee Ann Posavad for her pioneering work into pleatwork embroidery. The purpose of this guide is to understand how the pleats in the late 15th and 16th century pleated garments were actually created and secured. 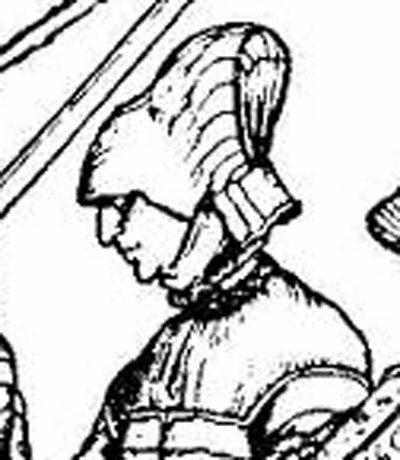 While it is possible for to create a pleated garment that looks similar to those portrayed and found using modern smocking techniques, there is particular interest in the techniques employed in the 15th and 16th centuries, which includes how the folds were formed and how the folds were secured. Special attention is paid to the idea that gathering threads, when used, were later removed (or covered) and other means were employed secure the folds. 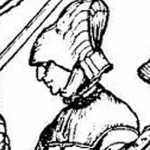 To this end, I have analyzed photographs of extant garments, photographs of high-resolution paintings, and peer-reviewed archaeological journal articles, with the goal of creating a well-researched guide that can be utilized by those who wish to confidently pleat authentic 15th and 16th century style undergarments. I’ve long thought that the wulst’s bulge is meant to indicate (or more likely simulate) a very full and thick braid (real or fake), as there are several extant images of German woman with braids wrapped around their head in a similar position. Given the enormous size of some wulsthaube, I seriously doubt it’s real braids and feel confident the wulst is a padded roll. Do we know for sure? No, as no extant steuchlein remain that we are aware of. Thus, be advised that some of this is guesswork. I feel confident this is excellent quality guesswork, as I’m standing on the shoulders of giants who’ve already blazed the research and recreation path here. 1. If you’re using reeds rather than millinery wire, start them soaking in water (you’ll want to give them a 2-3 hour soak so they are flexible enough to bend). 3. 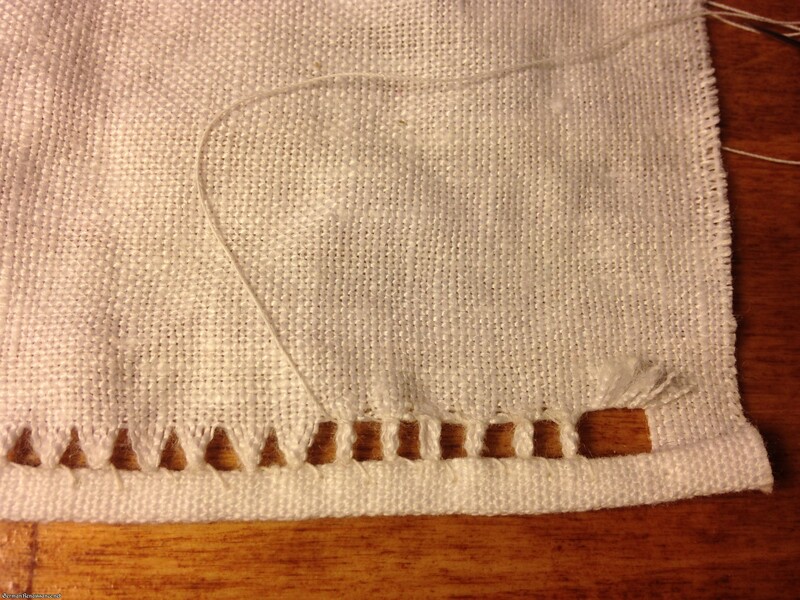 Iron your pre-washed linen and cut out the pieces in the pattern straight on the grain (to avoid too much stretch). If you have a particular large or small head, you may want to adjust accordingly. 4. Tie the umbinderlein around the head (or headform) at the hairline, tying it in the back. This provides stability. I use just a strip of linen cut on the grain, unhemmed. No one sees it but you. 5. 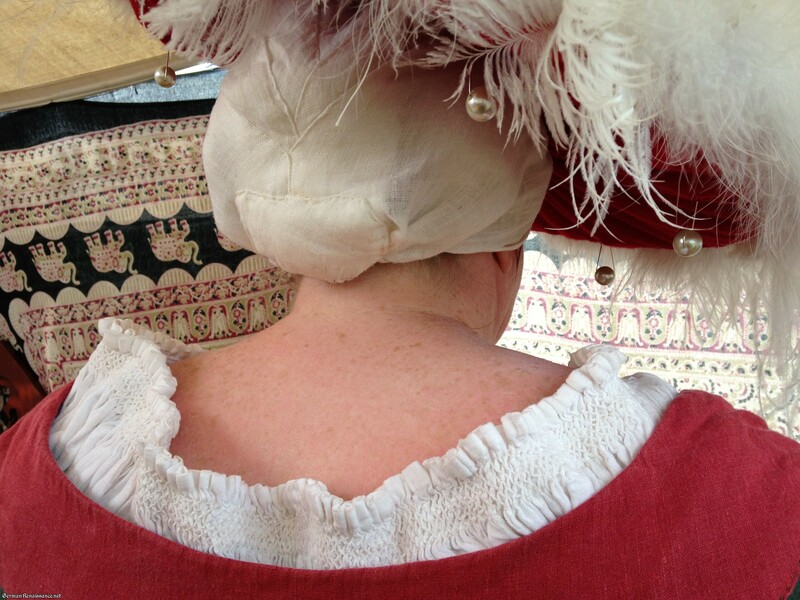 Wrap the unterhauben around the head (or headform) in the same position at the umbinderlein, making note of how far it comes (or overlaps) at the nape of the neck. 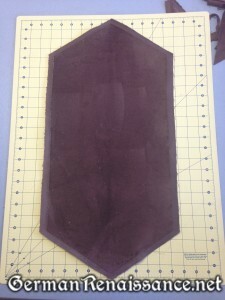 Now fold and sew in knife pleats at either end of the unterhauben so that it is at least two inches shorter than your head circumference measurement. I marked the general position of the knife pleats with blue dotted lines on the pattern. My knife pleats ended up being 2″ deep, meaning the finished length of the front edge was 23″ (originally 27″). 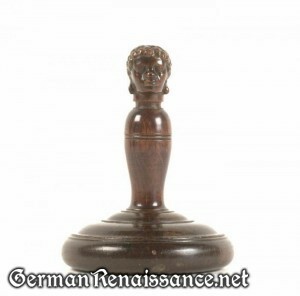 The two inch shortfall is necessary to give you stretch room, as the unterhauben will stretch a bit under pressure. 6. 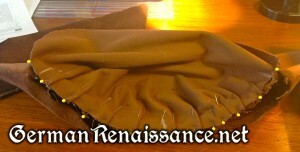 Fold over the front edge (the edge with the knife pleats), sewing in a cord or braid as you do that. Center it along the front edge. Your ties are long because they will wrap around your head later. 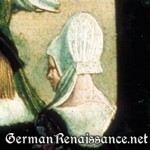 Place the unterhauben on your head (or head form). Note: If you don’t have reed or wire, you can simple make a round tube stuffed with padding. I have one like this and it works fine. 9. 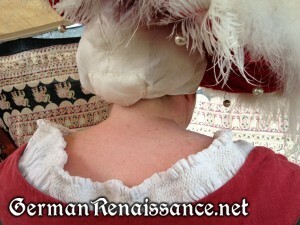 Place the finished wulst on the back of the head (or headform), under the unterhauben. Wrap the unterhauben around the wulst and pin it into place all around the wulst. Take the ties of the unterhauben and wrap them around and over the head, tying them on top. The video above shows how to do this very clearly. 10. Baste the unterhauben down to keep the wulst in place. 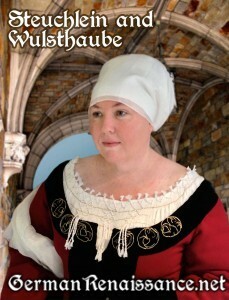 Your unterhauben is now complete and the unterhauben and wulst together are often called the wulsthaube. Keeping all this on your head is sometimes a challenge. Braiding and pinning your hair properly makes a HUGE difference — that’s a subject for another post, but basically I braid it and wrap it over my head, then pin it in place. The umbinderlein also really helps — if it slides too much, you can also experiment with make it out of silk to see if it stays on your head better. I also find that tying my unterhaube ties in front of my braid, rather than in front of the wulst, helps keep it on my head. Wearing a tellerbarret on top also keeps it in place. If all else fails, pin the unterhaube down really well! Post Note: I haven’t added photos yet of the process yet because when I originally made mine I took no photos. So I will make a new one and add photos later. If you really need something explained better, please post and I will reply or point you in the right direction! 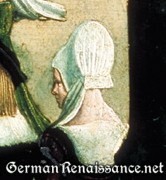 One of the iconic German hats seen in paintings and woodcuts is an oversized, brimmed hat with cuts/overlaps in the fold of the brim. 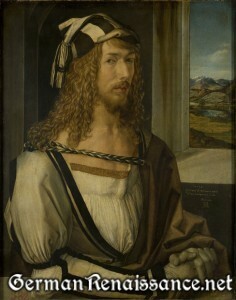 They appear frequently in Cranach paintings, for example. 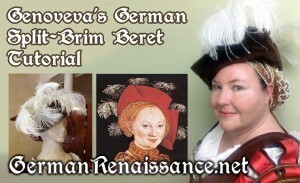 To my knowledge this hat has no name, so I’m naming it the German Split-Brim Beret! 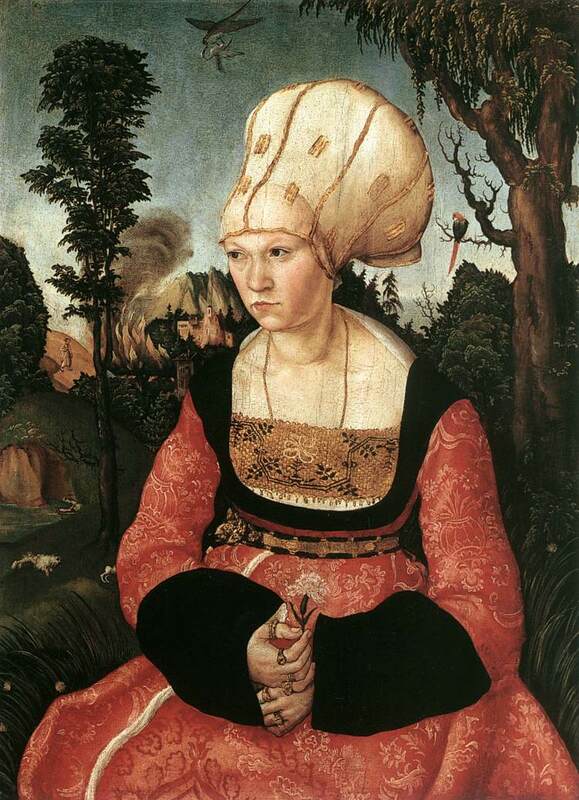 Knitted versions of this hat, or ones very like it, appear in the Germanishces Nationalmuseum, but judging from the paintings some of them are made out of velvet or felt as well, which is what this tutorial shows. In many ways, this is a just large flat cap with a wide brim that is flipped up. 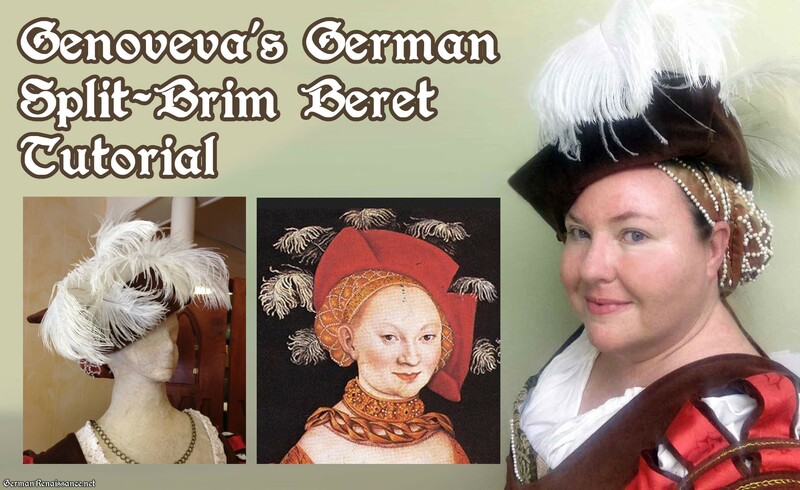 Here’s a very quick and dirty tutorial on how to make a German Split-Brim Beret for one of my readers who needs to make one TODAY to wear this weekend. Plus, today is my birthday and I took the day off from work and dashing off a quick tutorial was a fun treat for myself. Velvet, Heavy Felt, or Heavy Wool (no wimpy materials) — the color you see this hat in the most often is RED!! I only picked brown because I had a heavy brown velvet and I wanted it to match my pink and brown gown. 1. 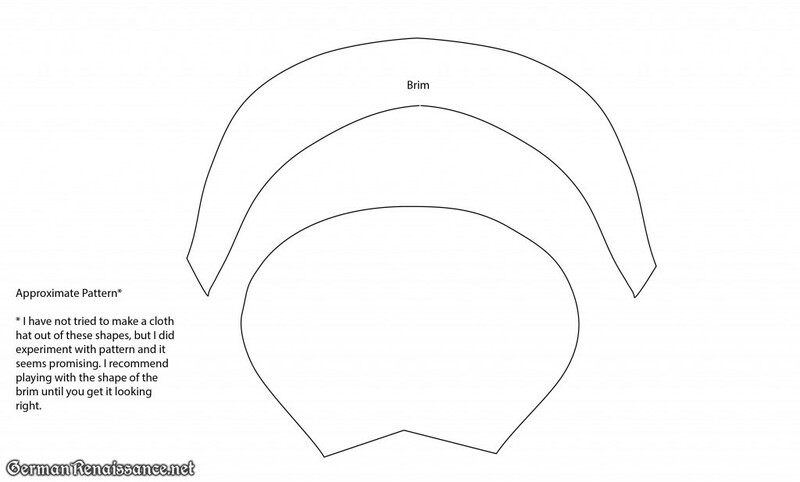 Cut out your pattern pieces from your hat material. You need four brim pieces and one crown piece from your hat material, plus two brim pieces from your iron-on interfacing. 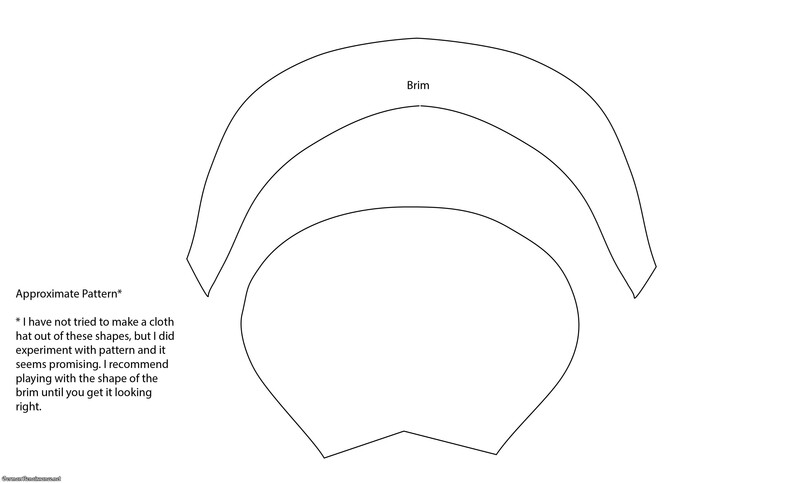 If you decide not to use the interfacing to essentially meld the two pieces of brim material together, this is possible but you’ll need to take more care when making your cuts in the brim later on (the cuts are optional, however). 2. Iron the smaller brim pieces to the larger brim pieces, wrong sides together, centering the smaller one inside the larger one. 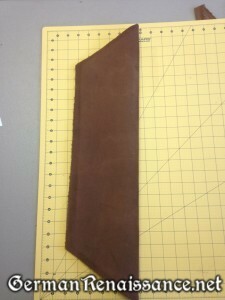 The 1/2″ edge where one piece is longer than the other piece will be called the margin from this point forward. 4. 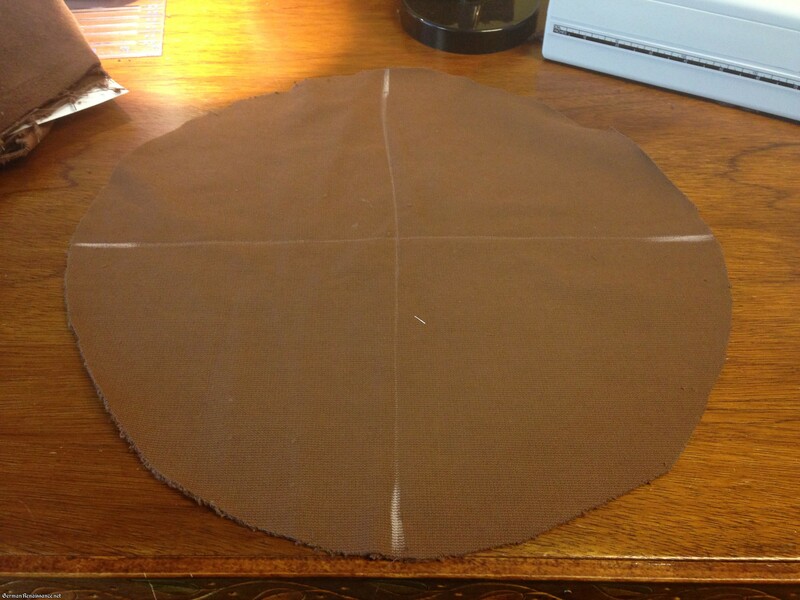 Fold over your brim pieces into a trapezoid shape with the longer margin facing out. The wider edge of the trapezoid is the top and the narrower edge is the bottom from this point forward. 5. Sew the two side edges of a brim piece closed along the narrow margin edges (stay at the edge of the margin where there are two layers, not four layers), then turn it inside out. I marked the place you should sew with a red dotted line on the pattern. Repeat with the other brim. You should now have two brim pieces with three finished sides and one unfinished side along the bottom. 6. Now take your crown piece and turn it wrong side up. Using chalk, mark the circle into four equal parts. You’ll use these marks as reference points when you pin in the next step. 7. Pin half of the crown edge to the bottom of one of the brim pieces, right sides together, pleating the crown as necessary to allow it to fit on the brim. That 1/2″ margin at the bottom edge of your brim pieces is there to help you pin and to avoid unnecessary bulk that makes it hard to sew. Do the same with the other side of the crown circle and the other brim. Note that you want the ends of the two brims to overlap slightly, which both hides the edges and gives the hat it’s proper look. 8. 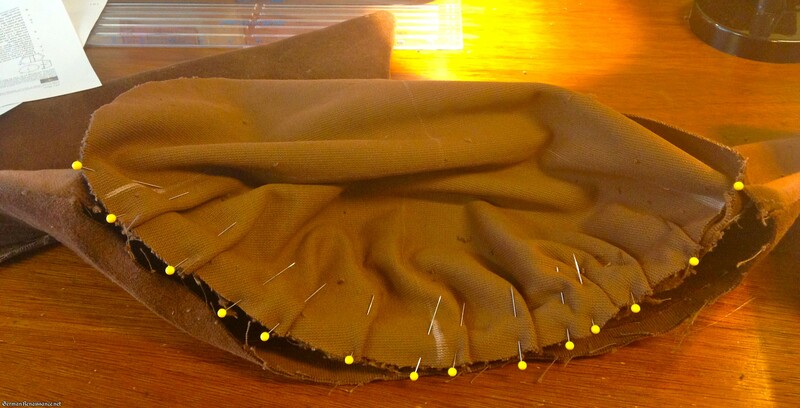 Sew the crown to the brim where you pinned it in step 6. I used a sewing machine, but you could do it by hand, of course. 9. Turn the hat right side out and flip up the brim. 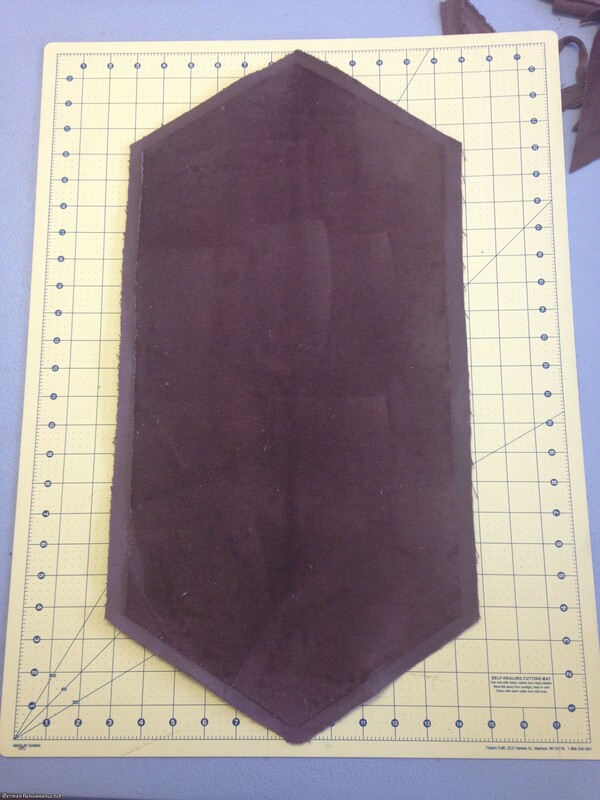 Now cut the brims halfway down each side from the top down about 1-2″ depending on your preference. 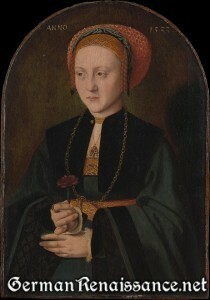 Refer to paintings, such as this one of the Saxon princesses, for placement and depth. 10. Curl your ostrich feathers. I did this by gently bending the spine of an ostrich feather over the edge of the dull back of a table knife, starting at the bottom of the feather. I walked the moved up the spine, bit by bit, gently bending and pressing the the feather against the blunt edge with my thumb. This makes a series of small dents. Avoid deep cuts or creases, which might cause your feather to break. 11. Place the feather spine stems in between the brim and the crown, so they curl over the outer edge of the hat, and sew down. Voila! You have a hat. Note that the hat was oversized on me on purpose — the hat had to cover my goldhaube and it sits at a pretty drastic angle on my head.